After giving a tour to some real estate folks in the neighborhood of Jamaica, Queens, where I work, I headed back to the office, shot off a quick email and then got on the Long Island Railroad to head to Penn Station, where I would catch a 6:30 Amtrak train that would take me to Baltimore in roughly 2 1/2 hours. Granted, on a Friday, train traffic can be just as miserable as traffic on the roads, so I didn't arrive at Baltimore Penn Station until 9:20, about twenty minutes late. There, my third cousin (we share a great grandparent) JoAnn, came to pick me up. I would be staying with her and her husband Andrew at their condo in Harbor East before my race the following morning. I hadn't seen JoAnn or Andrew since their wedding in Bermuda ten years ago, so it was a nice reunion. 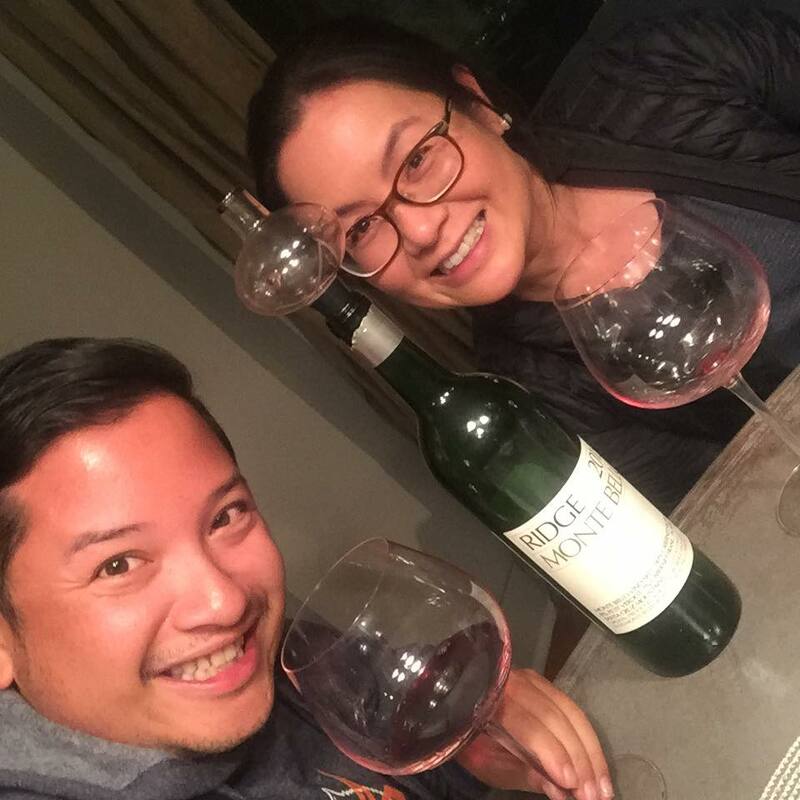 A reunion over red wine! And a reunion it was... over several glasses of delicious red wine (including a pricey bottle that we didn't realize was so pricey until we googled it, oops. Sorry Andrew...) and some good pasta from nearby restaurant Sabatino's, we reminisced about their wedding weekend and just generally caught up. 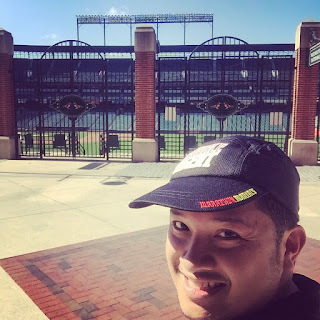 By the way, Andrew was already asleep... as he was planning to join JoAnn early in the morning to set up the Pacing 4 Parkinsons tent at the M&T Bank Stadium where the NFL's Baltimore Ravens play, before running the half marathon. And after a highball of Sagamore Spirit's rye whiskey (I apparently HAD to, according to JoAnn), I peaced out... or rather, PASSED out, to wake up at 6:30 the following morning. 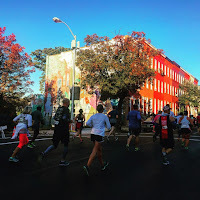 With little issue, I woke up at 6:30, got dressed, and out the door to walk the 25 or so minutes from their apartment to Camden Yards, where the startline of the marathon was at 8am. 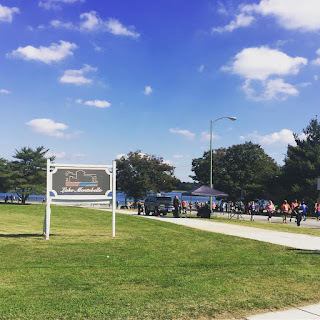 I headed further south down to the stadium to meet up with JoAnn and Andrew, who had been there since 6am, checking in runners who were participating in the races that morning. 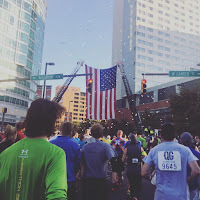 Andrew would be running the half that didn't start til 9:45, and started over on Conway and Light Streets in front of the Hyatt Regency at Inner Harbor. 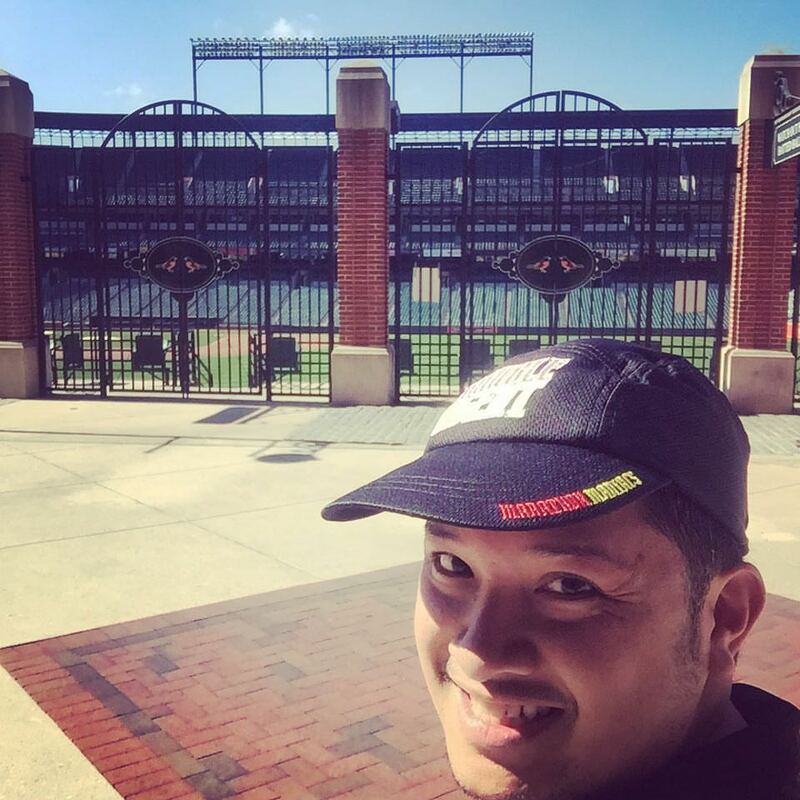 After dropping off my jacket and sweatpants with them (it was a little brisk walking over), I rushed back over to Camden Yards to meet up with Donna, Hollie, and Andrew, who were waiting near Gate G for the marathon to start. We heard the national anthem (complete with the Oriole-inspired "Oh!" 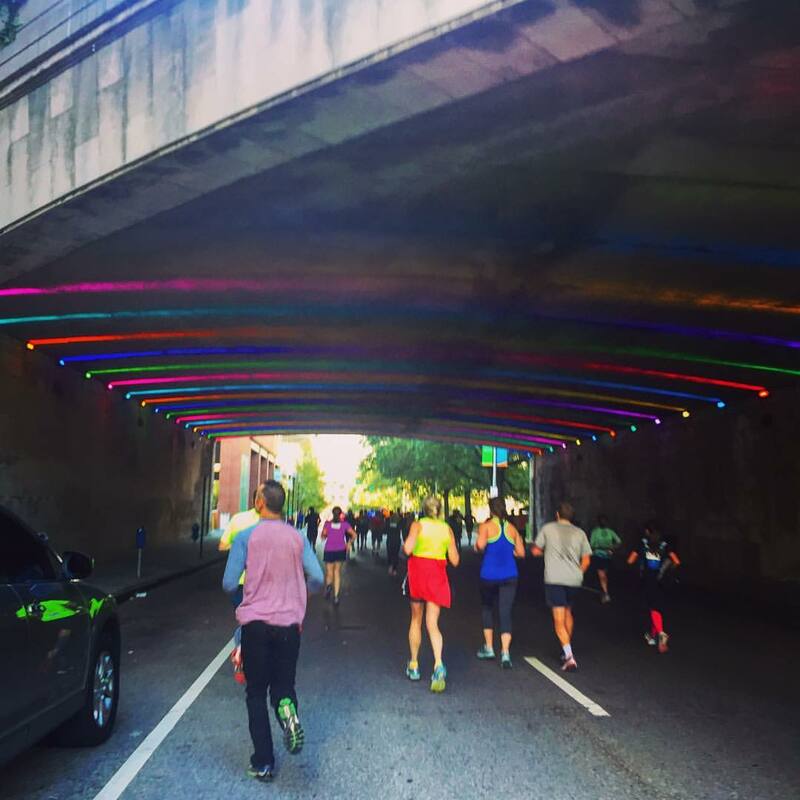 at the end of the song, made more famous on global television when Michael Phelps was flustered by hometown friends yelling it out during a medal ceremony at the Rio Olympics), and then we were off under a flurry of confetti on the route northward from the corner of Camden and Russell Streets! As we started, and I began to try to pair my Bluetooth headset to my phone, I realized that despite my efforts in charging the headset (I even saw the blue light indicating a full charge! ), it was completely dead. I settled for my wired earbuds, which I conveniently brought with me, just incase the need arose. We headed northward on Paca Street through downtown Baltimore, before turning slightly onto McCulloh Street at Mile 1. We then headed on a northwesterly direction along McCulloh Street along the rough boundary between the Upton and Madison Park neighborhoods. Upton, historically, has been one of the economic, political, and cultural centers of Baltimore's black community and is one of the focal points of urban revitalization programs. It was also known as staging grounds for much of the local and national civil rights movement. The streetscape consisted mostly of three story row houses, many of which are vacant - however, we did get to pass by some pretty murals along the sides of buildings that depicted the history of the area. 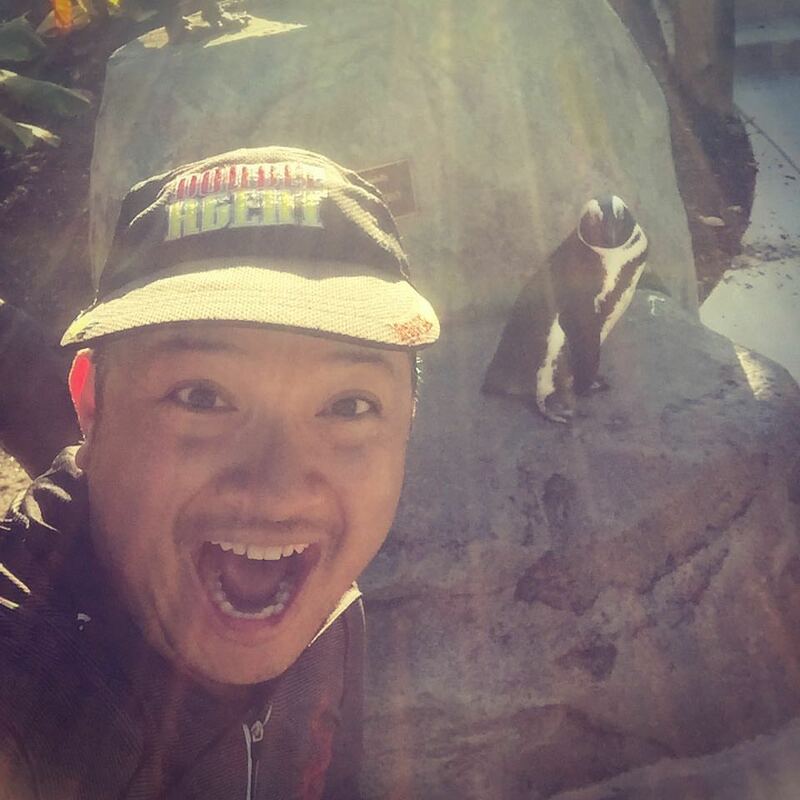 It was right around here where I realized my wired earbuds were not going to work either, as my Lifeproof case was too bulky to accommodate the earbud's connector plug. I decided to just run with my music blasting from my phone. 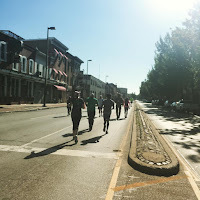 As we continued northward, we passed by the neighborhoods of Reservoir Hill and Penn North, also bastions of the African American community in western Baltimore. 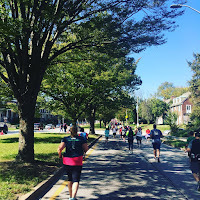 We hit the three mile mark as we skirted Druid Hill Park, all the while, running uphill from 43 feet above sea level at the start to 343 feet above sea level. We would pass by the Howard Peters Rawlings Conservatory building, and then make our way into the park via Greenspring Avenue. 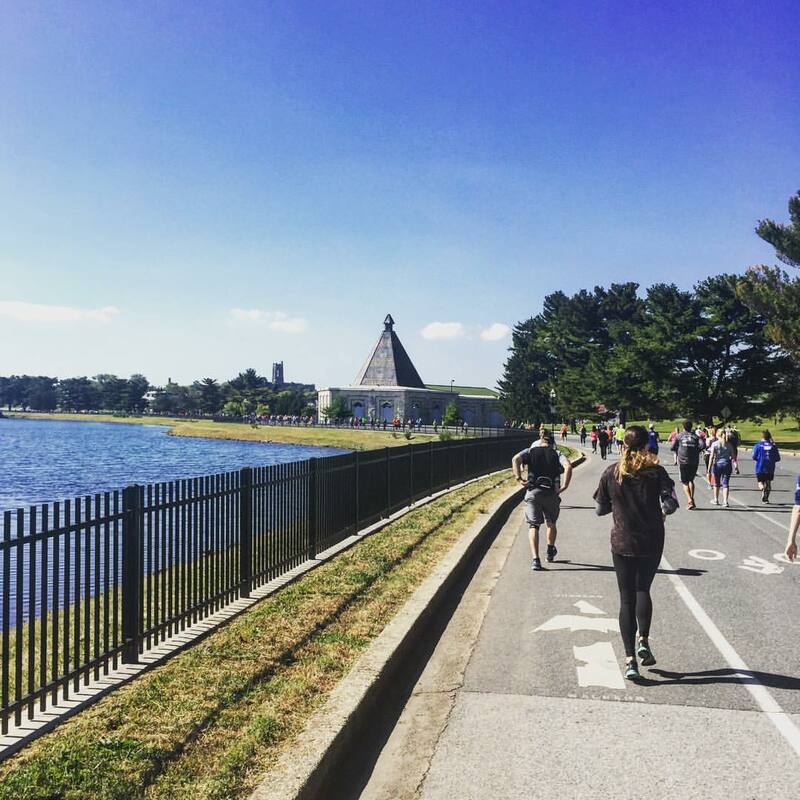 Runners running past the Rawlings Conservatory in Druid Hill Park. Shortly thereafter, three white tailed deer decided to run through the race course. As we ran along Greenspring Avenue, making our way to the hairpin turn onto Beechwood Drive (which would then take us into the grounds of the Maryland Zoo), all of a sudden, three white-tailed deer, come springing through the open green lawn, making their way toward that hairpin turn, and into the path of runners. Thankfully noone got hurt, but it was still quite a sight to see - not so crazy as what happened at Rock 'n' Roll Dublin in August, but nonetheless quite a surprise. As we made the hairpin turn, we finally were able to run downhill, as we made our way through the zoo grounds, taking Safari Place into the treelined Buffalo Yard Road, and then into the zoo itself, where we were greeted by several animals that the zookeepers had brought out for photo ops (likely the most photographed was the African black-footed penguin). 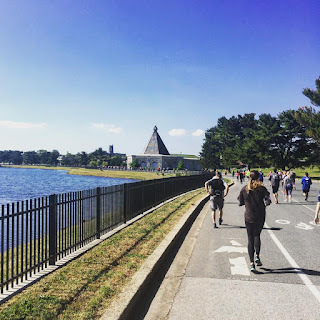 We made our way through the zoo rather quickly (not as lengthy as the route that the Colfax Half Marathon takes), and then found ourselves on Mansion House Drive and East Drive, with beautiful views of downtown alongside Druid Lake. Heading downtown past Druid Lake. 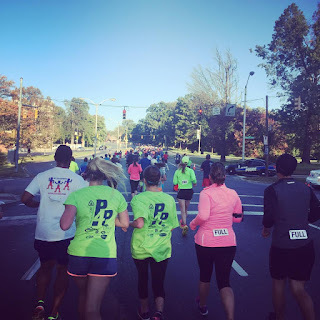 We emerged out of the Maryland Zoo and Druid Hill Park by taking the overpass over I-83, taking Wyman Park Drive and its winding path toward Johns Hopkins University, where we'd reach the mile 6 mark. 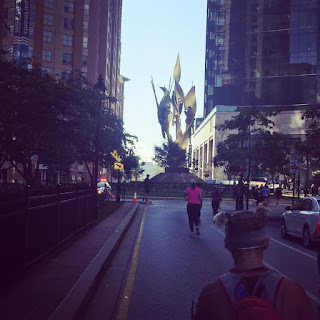 After curving our way around the bottom edge of campus, we made our way down to East 28th Street, and then along St. Paul Street, where we would make a straight shot southward back toward Downtown and Inner Harbor. We would make our way through several neighborhoods including: Charles Village, an area of two and three story rowhouses and apartment buildings that house many of Johns Hopkins University's staff and students; Station North, an arts and entertainment district marked by a combination of artistically-leaning commercial ventures, such as theaters and museums, as well as formerly abandoned warehouses that have since been converted into loft-style living; and Mount Vernon, one of Baltimore's oldest neighborhoods, and now a trendy area and the center of the LGBT population. Along this southerly route, I ended up running alongside a woman named Michelle, running the second leg of the marathon relay, who was intrigued by my playing of a few songs from the cast recording of Hamilton on my phone (which at this point I was just holding, because I got more out of listening to it in front of me than it sitting in my pocket-- plus, easier access to take photos), and we ran together for the next few miles. We had a blast as we ran through these historic neighborhoods, and we parted ways as I made my way through Downtown, as St. Paul Street became Light Street and we passed underneath a rainbow-lit I-40. 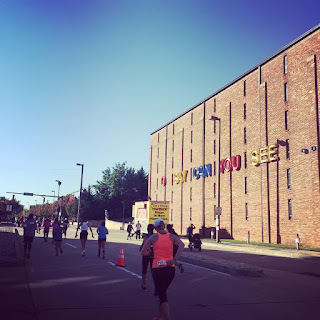 As we approached Inner Harbor, I ran past the mile 9 mark on the southbound side of the street, while on the northbound side of the street, the half marathon was about 15 minutes from its start. Best signs on the course... we saw them twice! 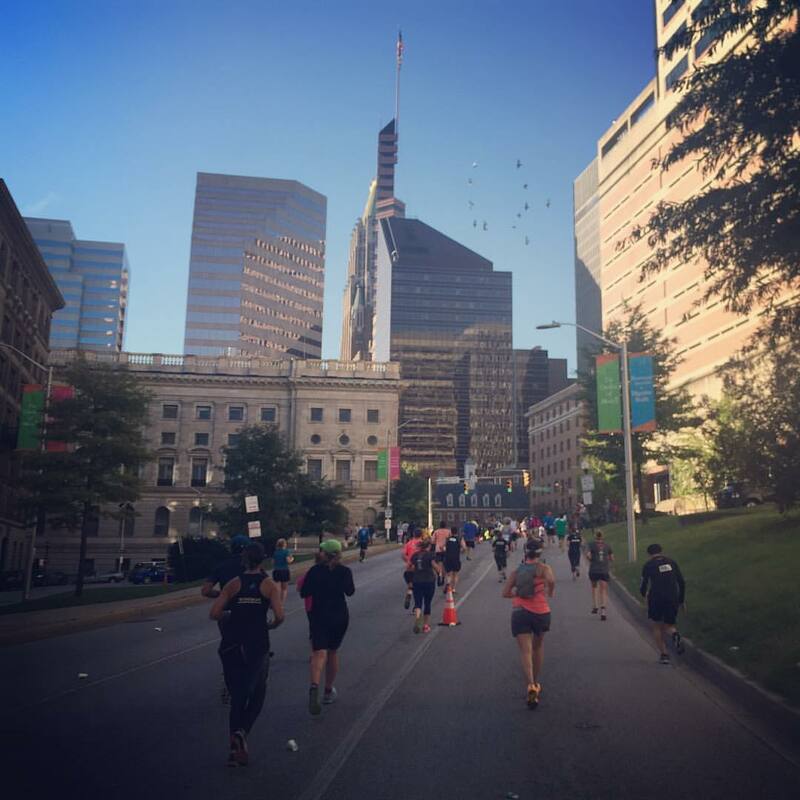 Running toward the William Donald Schaefer Building in downtown Baltimore. 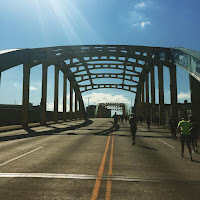 Lovely to run by American Visionary Art Museum, with its iconic "O Say Can You See" neon sign tribute along Key Highway! Stopping at one of the many benches along the course, this one in good condition! 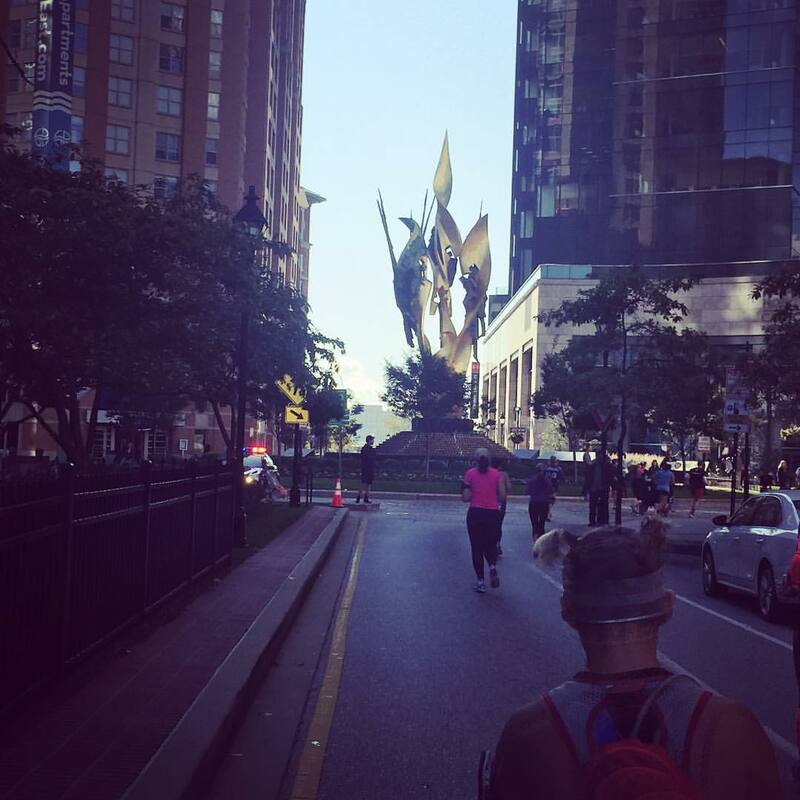 Running by the National Katyń Memorial, the tallest statue in Baltimore. Also the part of the course with the most treacherous surface to run on, a short section of uneven cobblestones! By mile 15, we were headed southeastward along Boston Street, into the neighborhood of Canton, considered to be one of Baltimore’s most popular neighborhoods and continues to see growth as more development opportunities come into the area. We passed by a beautiful waterfront marina, as well as many rehabilitated old industrial buildings, now a variety of office spaces, startups, and bars and restaurants - a prime example of adaptive reuse and preservation of historic landmarks. 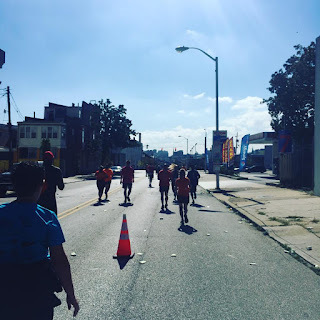 Heading northward on Linwood Street toward Patterson Park, as the route gets uphill for a few miles nearing mile 16. We turned left onto Madison Street for 3/4 mile, then headed back north again on N. Washington Street, as we inched closer to Lake Montebello. We ran through the heart of East Baltimore, through the neighborhoods of Middle East, which sits adjacent to Johns Hopkins Medical Center, and Broadway East, both lower income neighborhoods. At Sinclair Street, we took a short out-and-back, before heading up to Clinton Park, taking a turn past the famous Clifton Park Valve House, an eight-sided gatehouse that was to be used as the former water transporter for the eastern part of the city. We finally reached the highest elevation point in the second half of the course. 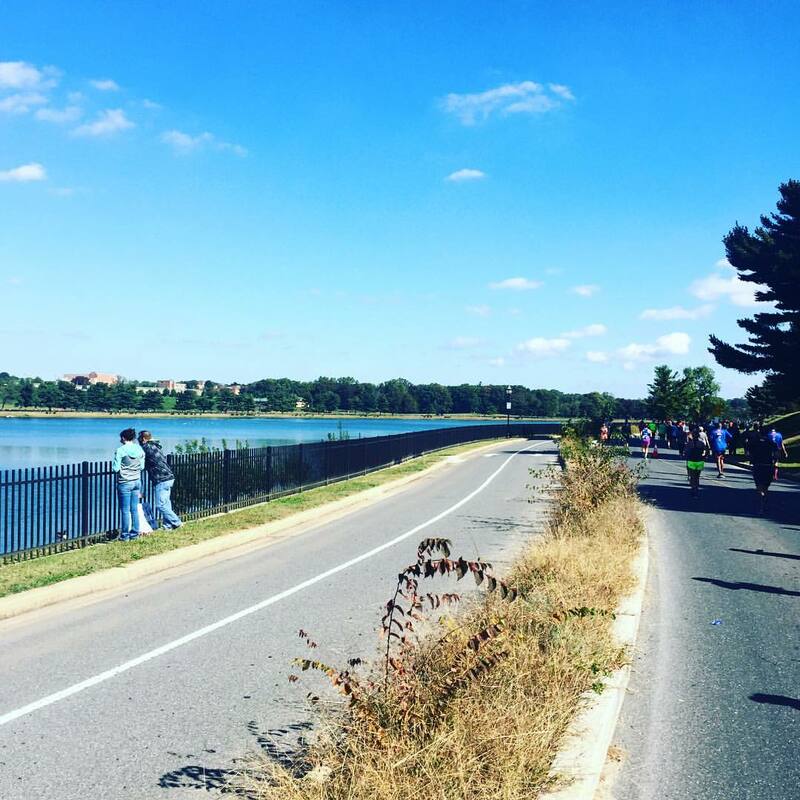 Before long, we were at Lake Montebello, a holding pond for the city's Department of Public Works regional water system. Entering on the lake's southwest side, we circled the lake's entire two mile circumference. As we left the lake, we entered the treelined 33rd Street in the Ednor Gardens-Lakeside neighborhood. 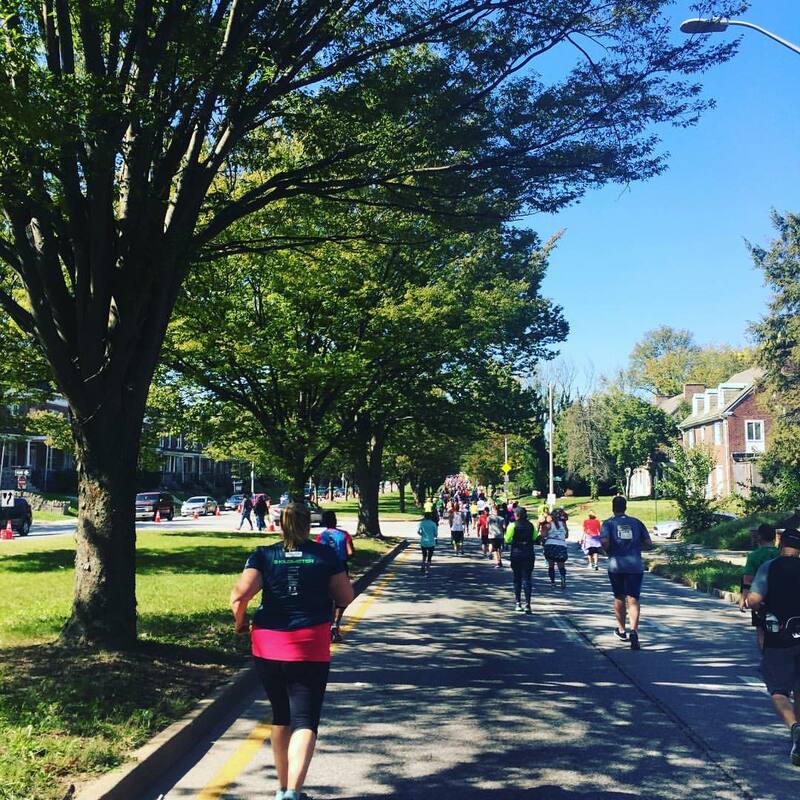 Originally designed by the Frederick Law Olmsted Brothers firm, 33rd Street is a long, wide, east-west parkway with a broad tree-shaded median strip. It was seen as a center point of their Baltimore Plans of 1904 and 1921, establishing stream valley parks and connecting boulevards. 33rd Street has a tendency to roll up and down very slightly, so by then, my legs were already beginning to scream at me to stop. 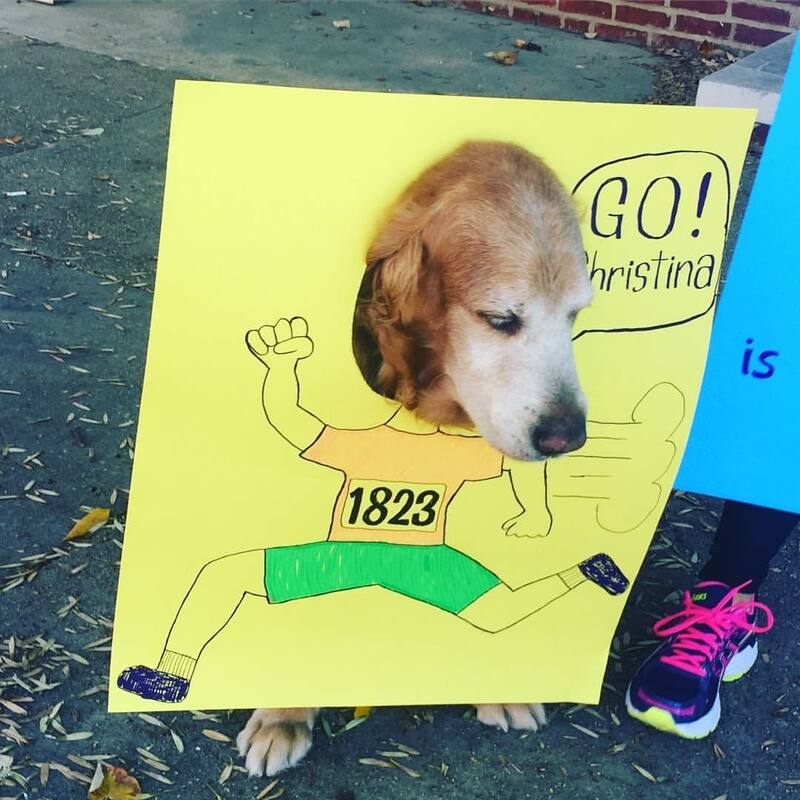 This length of the course was only about 1 1/4 miles. 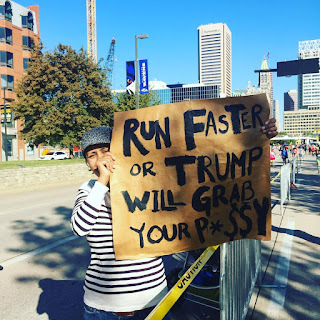 Of course, it's onward, especially at the pace I was going, where with 3 1/2 miles to go, I was about 4 hours and 15 minutes into my race. I could easily make it under five hours if I kicked it into high gear. So kick it in to high gear I did. 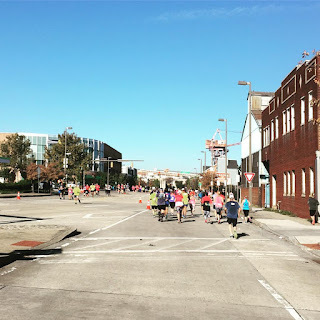 We turned left onto Guilford Street, where would go for about four blocks, before turn right onto 28th Street, and then left again on Howard Street, which we would tak eall the way down to the finish line. 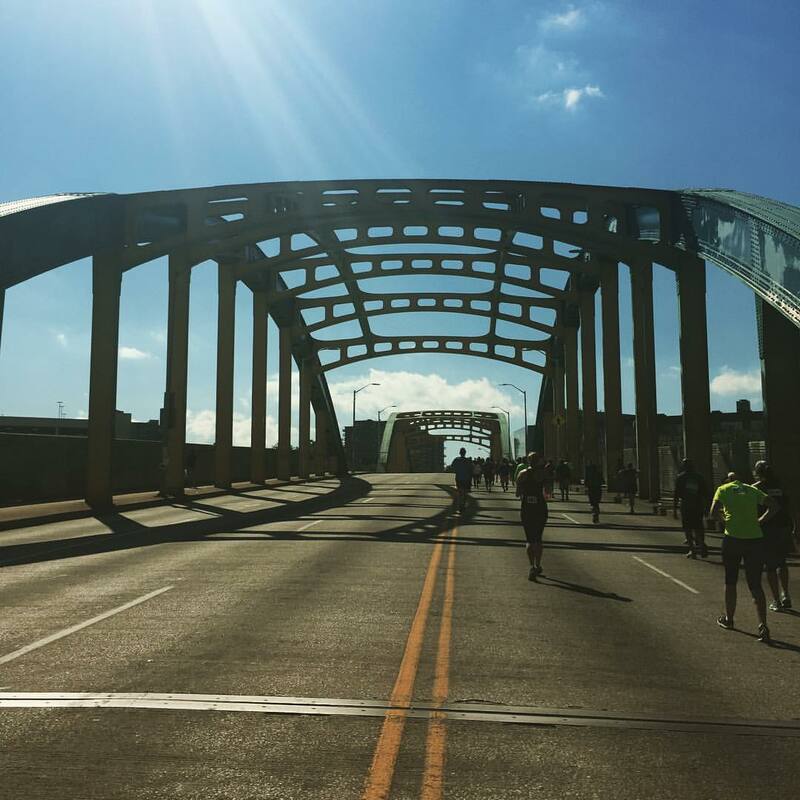 We crossed through the neighborhoods of Remington, Charles Village, Old Goucher, and over the Howard Street Bridge traversing I-83. Thankfully, from this point on, it was smooth sailing to the finish, as it was all downhill. 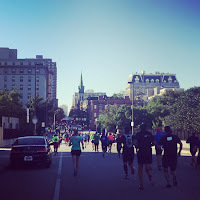 There were plentiful crowds as we headed into Downtown Baltimore taking a slight right onto Eutaw Street, and ultimately just past the famous Camden Yards, where our finish line was waiting for us. 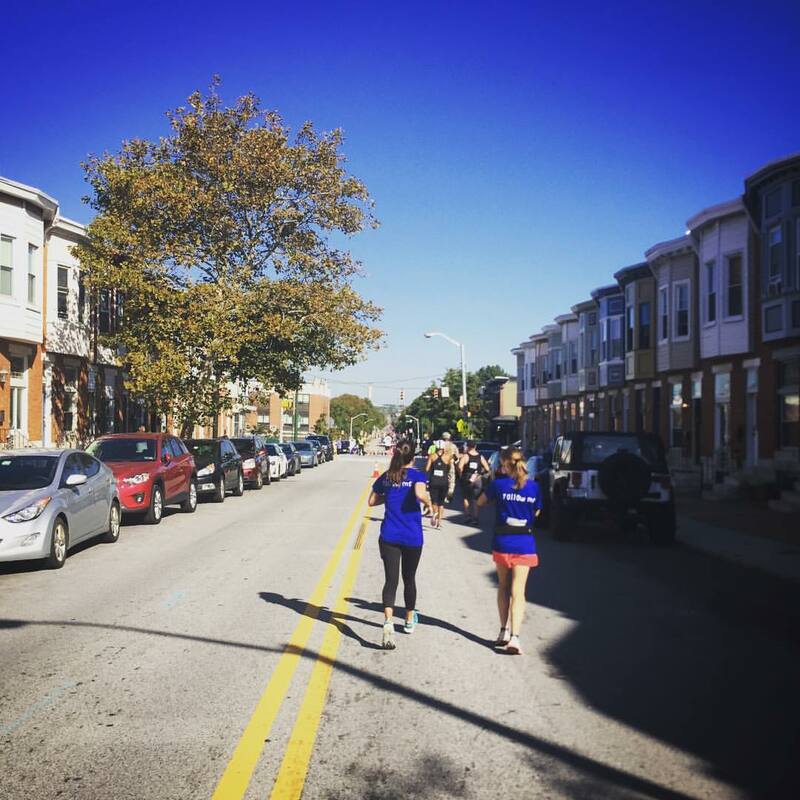 Less than three miles left to go as we head down Howard Street in the northern Baltimore neighborhood of Remington. 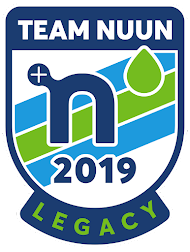 I crossed the finish line in 4:58:23, which was the first time I had finished in a sub-5 hour race that wasn't a fll downhill (like Utah) since the summer. 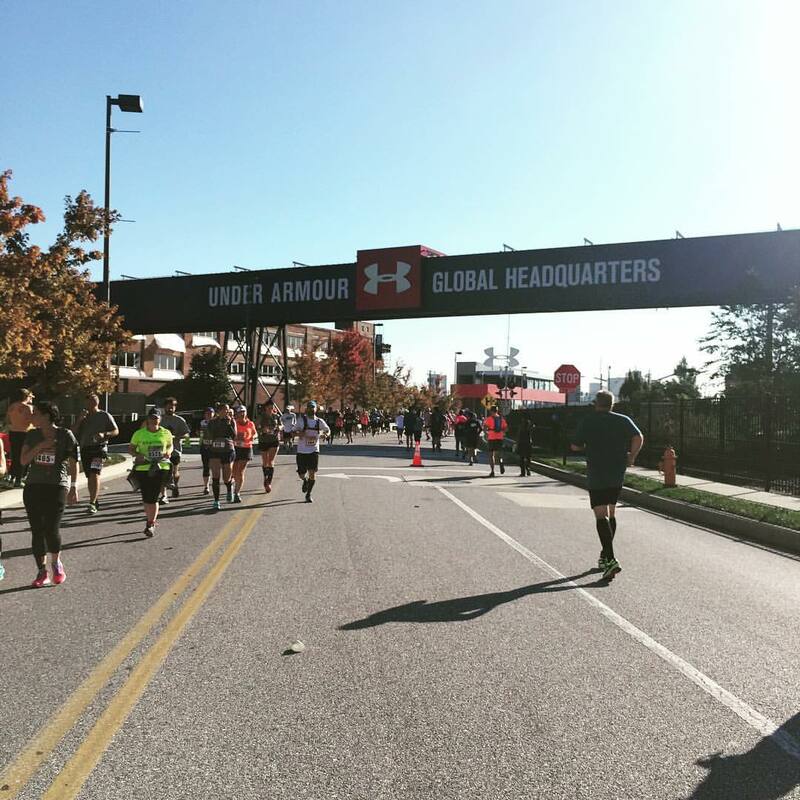 I was very happy with my time, as it wasn't the easiest course - there were some decent hills that I had to traverse. And it was my first full marathon I could say I had run, for the most part, without music in my ears. 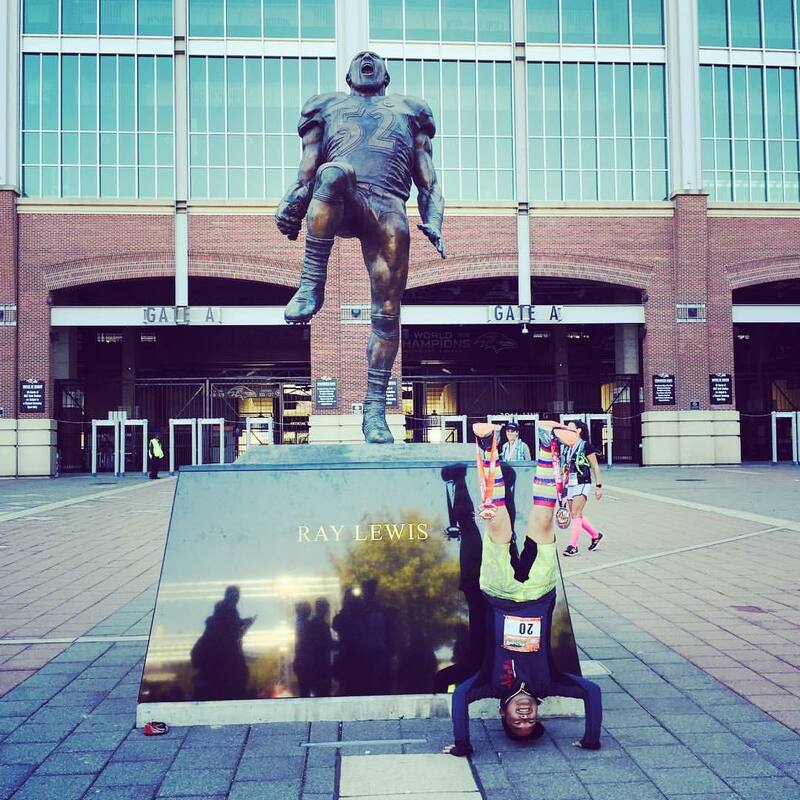 That's the way to do a #victoryheadstand... in front of the Ray Lewis statue at the M&T Bank Stadium! Finished in 4:58:23, a return back to sub-5 land! 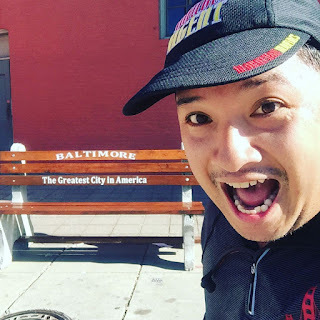 After finishing, I retrieved my finisher medal (the coolest ever... a crab that opens up to reveal the Baltimore skyline!! 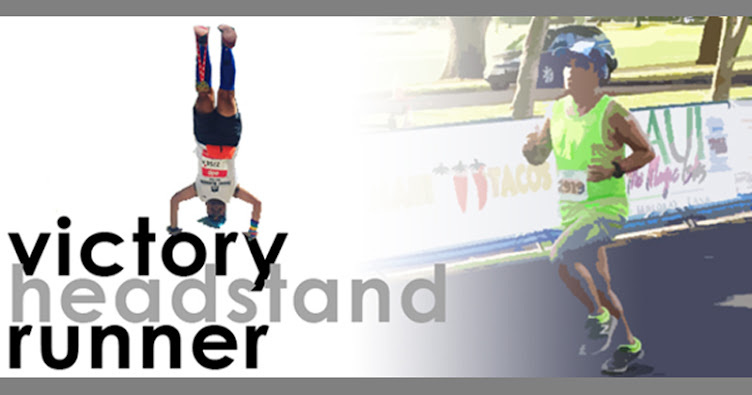 ), as well as the special medal for completing both Frederick and Baltimore in 2016, and then met up with JoAnn, who joined me at M&T Bank for my headstand photo. 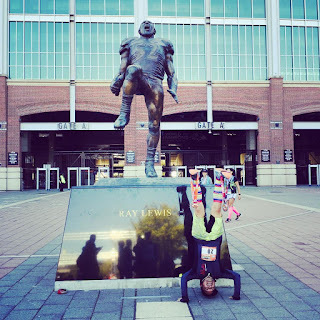 I chose to pose in front of the Ray Lewis statue, even though I had no clue who he was (don't blame me, I don't watch pro football!) I suppose he's famous in Baltimore... LOL. I headed back to JoAnn and Andrew's place to grab a shower, and get rolled out by JoAnn's friend Jason (Everyone check him out at Charm City PT, if you're ever in the area), and then ate a delicious meal to my heart's content. An amazing way to celebrate another marathon in the books... a Peanut Butter and Bacon Burger from Abbey Burger Bistro, and Brewers Art Resurrection Beer! 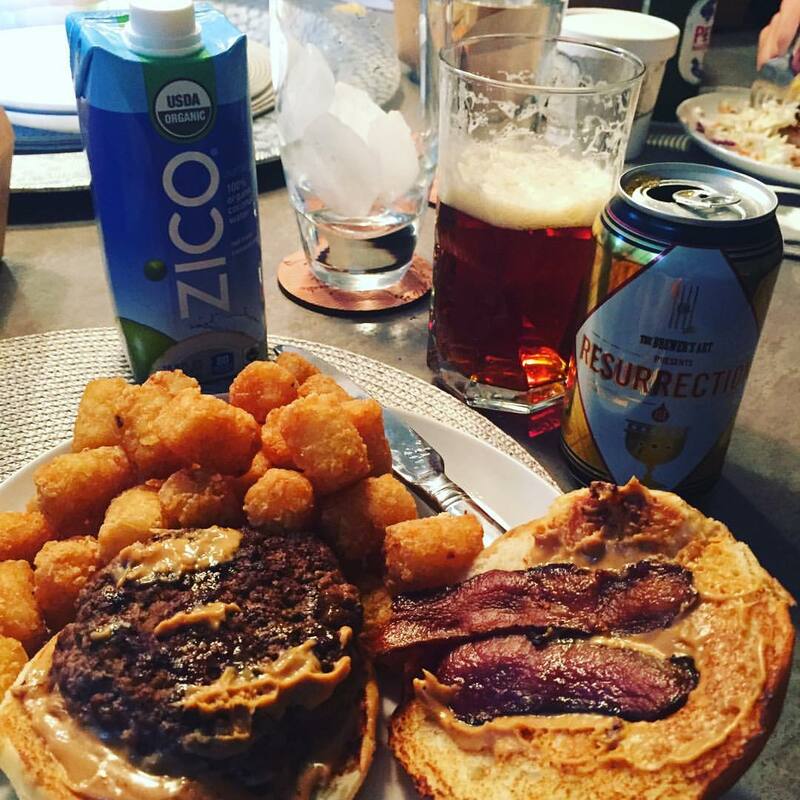 And a Zico Coconut water for rehydration purposes. My trip to Portugal constituted of the last 4 days of my European journey. When I last left off, I had spent three days in Berlin, followed by two days in Karlsruhe with my aunt. I took off Wednesday afternoon from the train station in Karlsruhe, heading to Frankfurt where I would board my flight to Lisbon, arriving in the evening. Thankfully, my Airbnb was only a short train ride away from the airport on the Metro, so upon finding it (and having to deal with broken or non-operating ticket machines... a woman leaving on a flight that night happened to find me and just give me her day-ticket valid for the remainder of the evening, which allowed me to get onto the platform!) I got to the apartment building about a five minute walk from Oriente station very easily. Navigating Oriente at night though was a little daunting - there's a considerable amount of vagrants that hang around the lower level, and the area wasn't the best lit. Thursday morning, I headed to the expo at MEO Arena along the Rio Tejo, a short walk from my Airbnb. The expo was small, but efficient - I picked up my bib and went around, covering ground in a mere 15 minutes. I was handed a banana from the Portuguese island of Madeira on my way out. 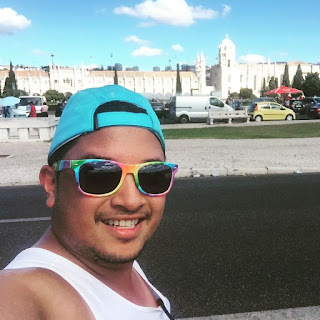 After my quick trip to the expo, I took some photos along the river, and then decided to do some sightseeing, heading to the Rossio, Lisbon's main square. From Oriente to Rossio on the very easy to navigate Lisbon Metro, it's about 30 minutes. You have to take the Linha Vermelha to Alameda, and transfer to the Linha Verde line. Alameda is also a sizable station, so it's a little bit of a walk to get from one line to the other. 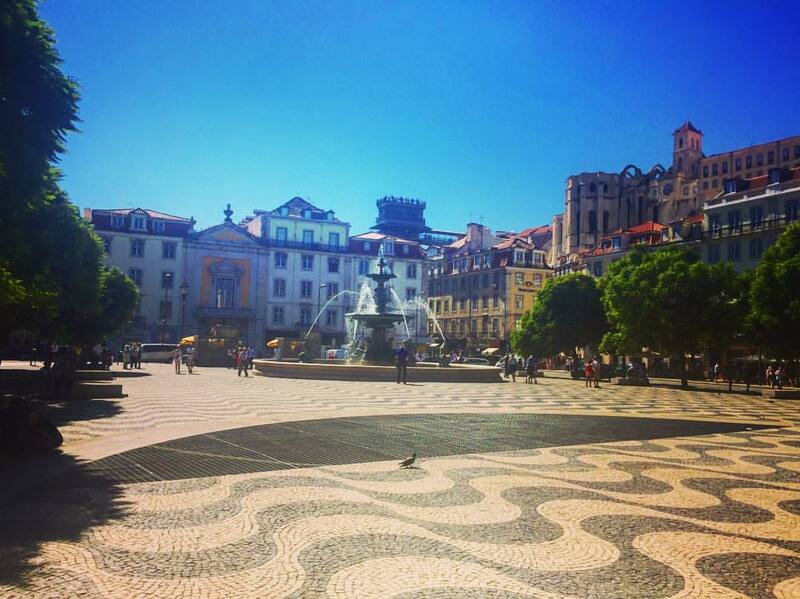 When you come out of the Metro at Rossio, the area is so vibrant. The main square is pretty massive, adorned with two bronze fountains imported from France, and the notable Column of Pedro IV monument. The ground is paved with a wave pattern using Portuguese mosaic tile. The Chiado and Bairro Alto districts of Lisbon lie directly to the west, prominently marked by its higher elevation, looming over the Rossio. 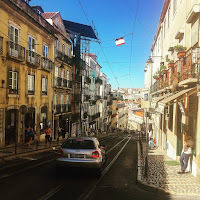 In my research preceding my trip, I had read a lot about the beauty of the Bairro Alto. The neighborhood sits up on a hill, and hoofing it up those hills with sometimes slippery footing takes a lot out of your lungs. It was absolutely worth it, though... the views are unimaginably beautiful. I let myself wander the area without a care to look at a map, discovering alleyways and streetscapes that one would probably not normally see if led on a guided tour. "Getting lost" in a place like this is probably one of my most favorite things to do as an avid traveler. 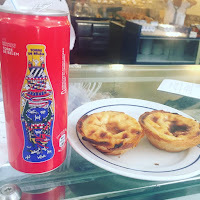 I spent a couple hours just wandering - and in the process found a great little restaurant called Frutaria Saldanha... well, something known as a "frutaria," which is more of a corner store/snack bar that serves food. Truly, the secret to finding a good restaurant in Lisbon is to just keep walking away from tourist traps - especially those that have a single menu in Portuguese, and not translated in the other languages. Yes, it's a big chance to not know what you're eating (perhaps you'll luck out! ), but finding a family owned restaurant where the husband and wife serve multiple roles as host/hostess, cook, waiter/waitress, and busser, is a goldmine in tourist-heavy Europe. Frutaria Saldanha was just that, where I had the legume sopo da dia (a bean soup), a bacalhau fritter (bacalhau is cod - either dried or salted - Portugal's most prominent fish choice), porco al alho (garlic braised pork cutlet), and a half liter of Portugal's very fresh and tasty wine, vinho verde. All for under €15! Stairs and roads up... leg strength needed! Pasteis de Belém. God's gift to Portugal. After lunch, I continued to wander Bairro Alto, making my way to the more grid-like streets of Chiado, a shopping area that mixes old and modern commercial establishments with cultural landmarks like museum and theaters; and Baixa, an area that was rebuilt after Lisbon's devastating 1755 earthquake, and also a shopping destination, catering to souvenir shops, international chains, and archaic-but-charming shops like haberdashers. 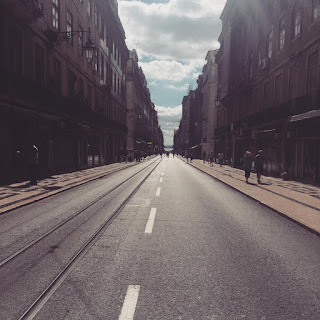 I also headed over to Rua Augusta, the main drag of the Baixa, that culminates in a triumphal arch where the street meets the Praça do Comércio on the Tagus River. 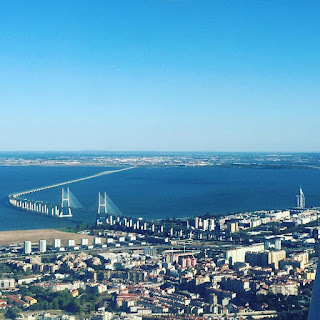 I then decided to take a tram westward toward Belém, and on the way there, passed the 25 de Abril Bridge, oftentimes compared to San Francisco's Golden Gate Bridge. 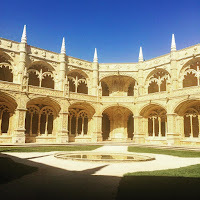 Belém is famous for its many museums as well as the ornately decorated Jerónimos Monastery and iconic ceremonial gateway/fortified bastion of the Torre de Belém, both classified as UNESCO World Heritage sites. 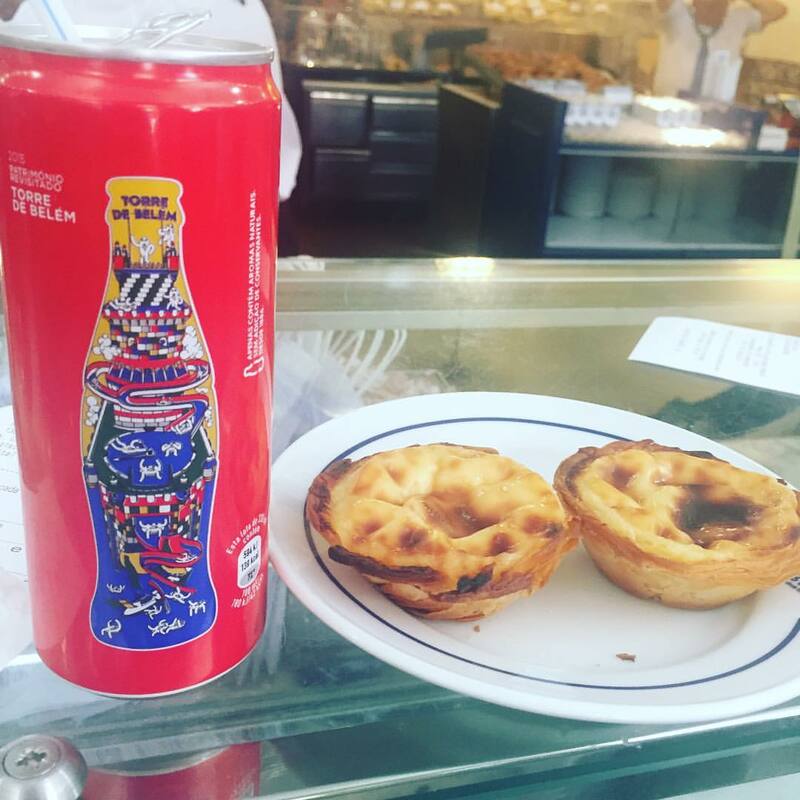 It's also well known for the pastry shop Fábrica de Pasteis de Belém, known for the pastel de Belém, an egg tart made with flaky pastry. 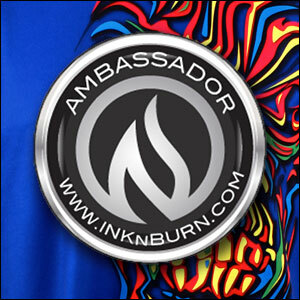 Sometimes the lines at this shop can be out the door and around the block - but luckily, it wasn't so bad when I arrived! 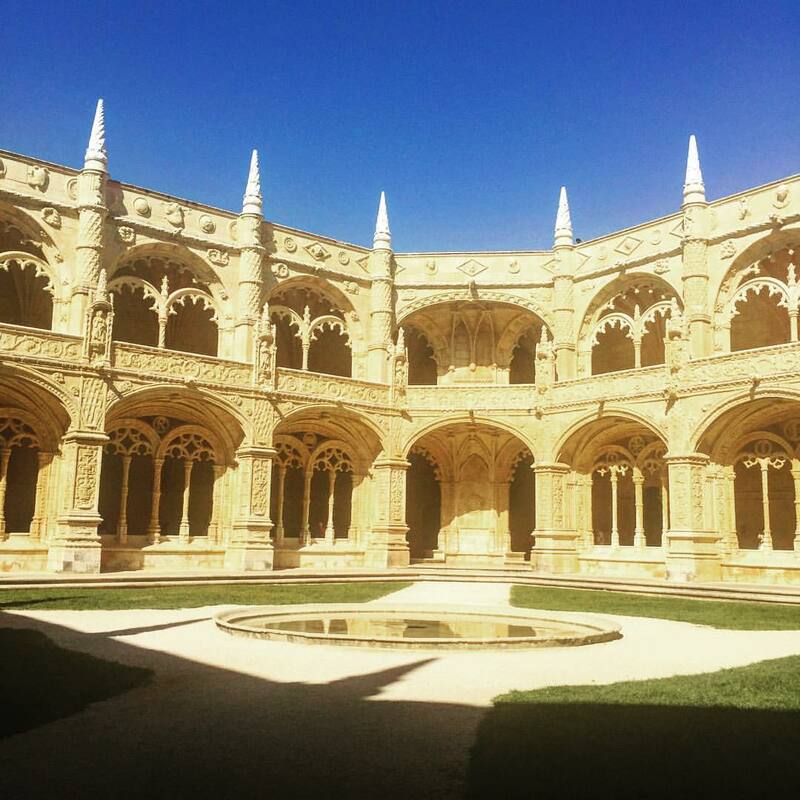 I decided to also check out the Jerónimos Monastery, which had a ticket that included access to the Museu Nacional de Arqueologia. 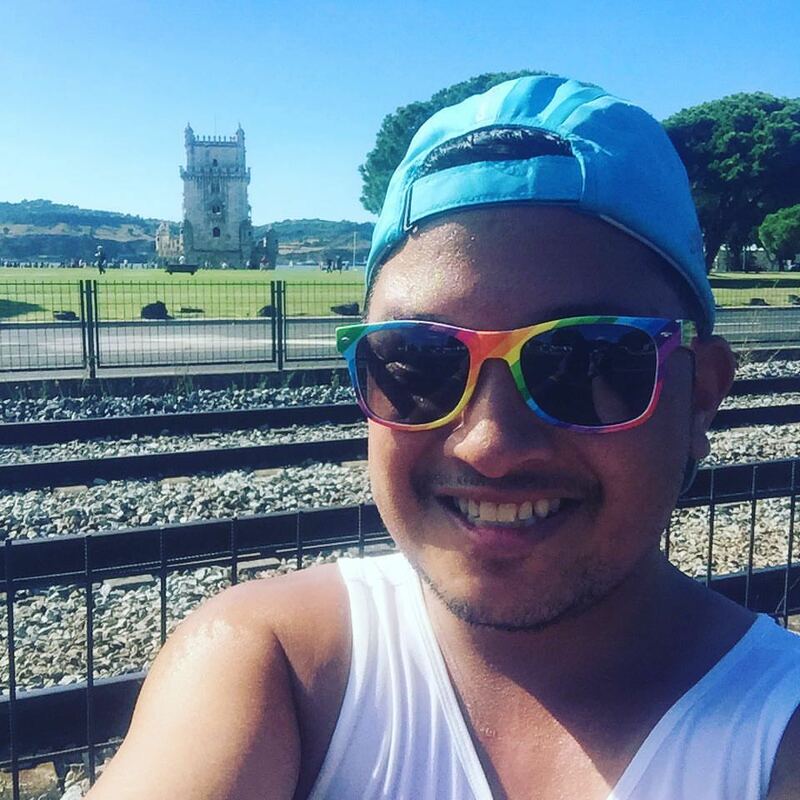 If I had arrived an hour or so earlier, I probably would've been able to check out the Torre de Belém, but unfortunately they limit the amount of visitors to climb the tower after a certain time of day. Construction on the monastery and church began in 1501, and was completed 100 years later. 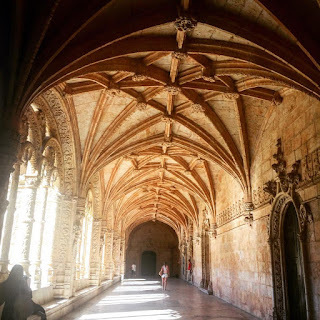 The monastery was designed in a manner that later became known as Manueline: a richly ornate architectural style with complex sculptural themes incorporating maritime elements and objects discovered during naval expeditions, carved in limestone. The interior of the two-story cloisters is absolutely beautiful, complete with groin vaults with wide arches and windows with tracery resting on delicate mullions. One of the rooms includes the refectory, marked with several azulejos tiles from the 17th century. I headed over to the Archeological Museum, but only got to see part of it, as there was a film crew utilizing the museum for a documentary when I was there. Groin vault ceilings in the cloisters of Jerónimos Monastery. 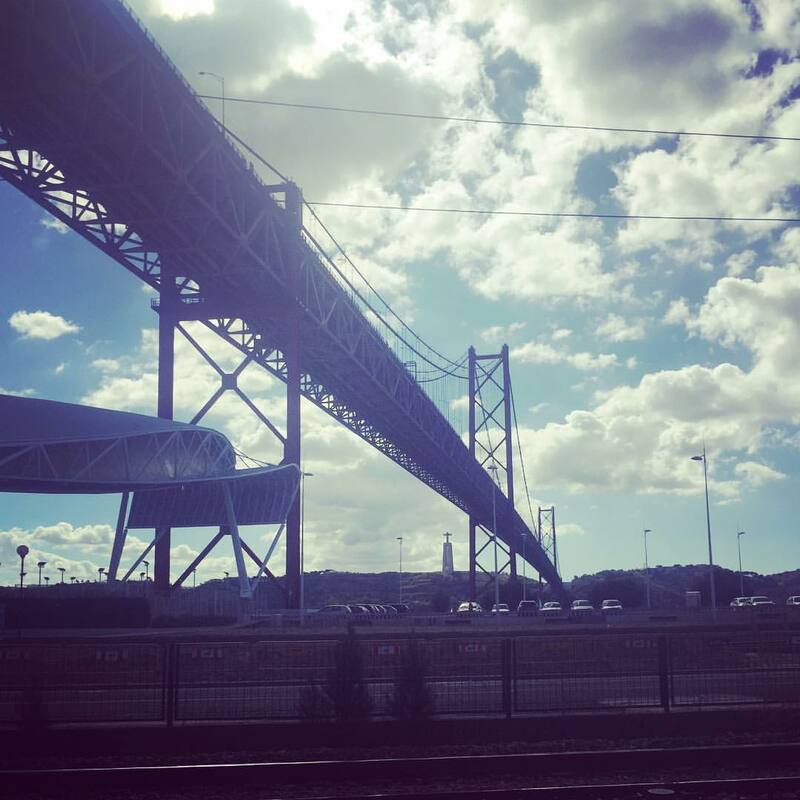 I headed back into town via tram, and then boarded the subway back to Oriente from the Cais do Sodre station; it was obviously rush hour, as tons of people were loitering in the area, not only waiting for trains, but also for the ferry to take them over the river to Almada and Seixal. I had made plans for the following morning to meet up with my Black Sheep friends Jen and Pete up in Porto the following morning, so I made it back to Oriente to get dinner near my Airbnb and then get some sleep since I was planning on taking the first train out of Lisbon in the morning. 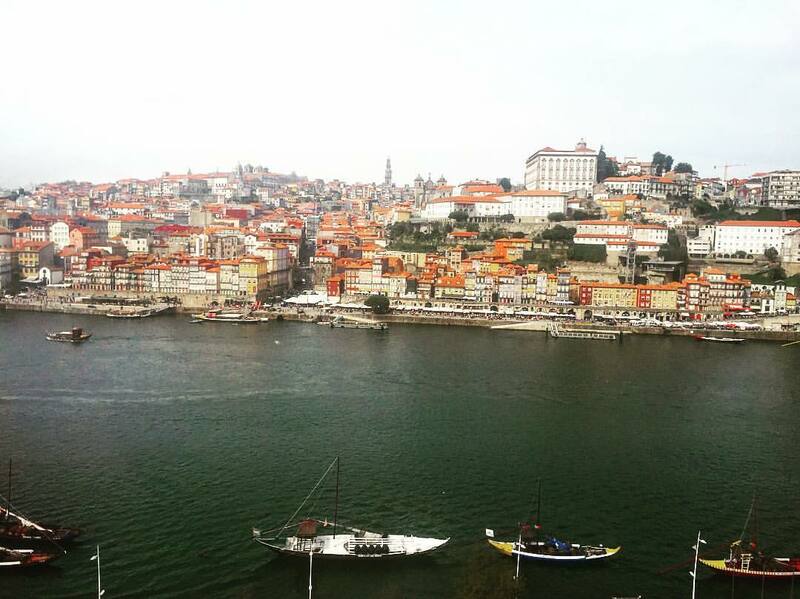 The trip up to Porto is about 2 hours and 45 minutes, give or take ten minutes depending on time of day. Leaving on the 6am train from the perfectly situated Oriente station, I arrived at Porto Campanha station just before 9am. Campanha is where the non-local trains arrive, so people have to transfer over to via the suburban rail line to São Bento, which serves as the city centre terminus. 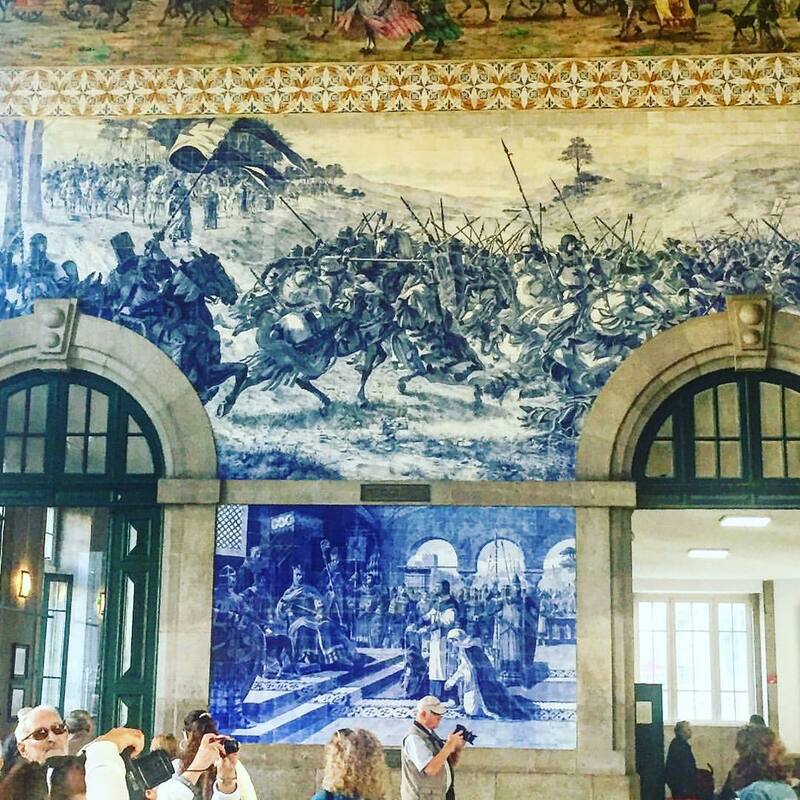 The São Bento station is quite magnificent, notable for its large, magnificent azulejo tile panels in the vestibule. 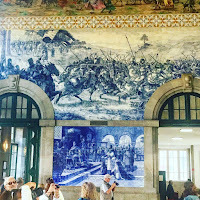 Created by Jorge Colaço, the most important azulejo painter of the time, these tile panels were put up between 1905 and 1916, and depict landscapes and ethnographic scenes, as well as historical events like the Battle of Valdevez in 1140, the meeting of the knight Egas Moniz and Alfonso VII of León in the 12th century, the arrival of King John I and Philippa of Lancaster in Porto in 1387, and the Conquest of Ceuta in 1415. I met up with Jennifer at the station, and it was quite a nice reunion, as she had just arrived the night prior after a long trip from the US to Lisbon, followed by the train ride up to Porto, all in one sitting. 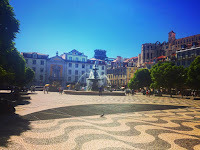 We had breakfast just across the street from the station (introducing her to the wonders of pasteis de Belém, ubiquitous everywhere you go in this country!) and then we wandered the area around the city for a bit until Pete arrived. Pete was flying down to Porto directly from his temporary assignment in London, and after a little miscommunication as to which railway station we were meeting at, he found us at a sidewalk cafe on the Praça da Liberdade, also steps away from São Bento station, where Jen and I were already a few glasses deep into our morning beverages and pasteis. After dropping things off at Jen and Pete's Airbnb, we filled the rest of the day up with sightseeing all around this beautiful northern Portuguese city. Porto is actually the country's second largest city after Lisbon, and has a very unique history from its origins as a Celtic settlement known as Portus Cale (which eventually gave rise to the modern name of the country of Portugal), falling under Roman occupation and later, control under the Moors during the invasion of the Iberian peninsula in 711. Porto was also the site of shipyards that contributed to the shipbuilding of the 14th and 15th centuries and was the launch point of Prince Henry the Navigator's voyages to the open waters of the Atlantic and exploration of the western coast of Africa, initiating the Portuguese Age of Discovery. Most notably, one of Portugal's internationally famous exports, port wine, is named for Porto, since the metropolitan area, and in particular the caves of the twin city of Vila Nova de Gaia, were responsible for the packaging, transport and export of the fortified wine. We wandered all over Porto, checking out Porto Cathedral and its impressive views of the surrounding neighborhoods including the Torre dos Clérigos; along the Ribeira with the beautiful homes in a span of different vibrant colors; and wandered over the Ponte Dom Luis I, the double-decked metal arch bridge that spans the Douro River to the city of Vila Nova de Gaia, while admiring the purple of the morning glories as well as the tapestry of buildings that dot the riverside. While on the other side of the river, we took the teleférico (cable car) from the upper deck of the bridge down to the Gaia riverside promenade. We wandered up into the hills of the city to check out the port wine cellars, and hit up two - the Cockburn's Port Lodge and Quevedo Port Wine. 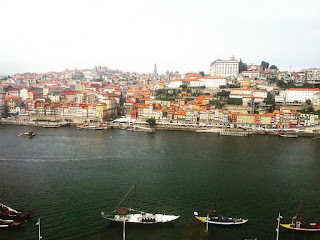 We grabbed a delicious late lunch on the riverside, and then took an Uber back to Porto, making our way back to the other side of the river via the lower deck. Pete headed back to the Airbnb to nap, as he had been battling a chest cold for much of the week prior, so while he slept, Jen and I took off to discover more of the Porto riverside along the Douro. 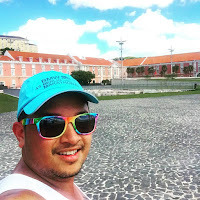 We wandered along the Rua Nova da Alfândega, to a little plaza area, and decided to just find our way back up into the city through the narrow streets. 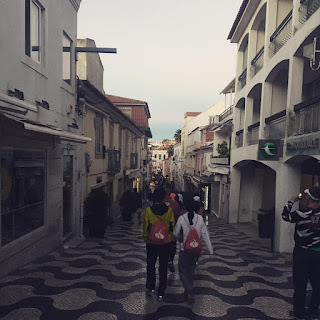 We ended up ascending several steep stairways and roadways making our way back into the middle of the town past some beautiful buildings, some with the gorgeous azulejo tiles adorning their exteriors. We retrieved Pete before heading back out for a quick dinner near the pedestrianized Rua de Cedofeita, and then retired for the night. Our fun Black Sheep Trio - Jen, myself, and Pete - at Peña Palace in Sintra. The following morning, we got up early to grab the train back to Lisbon (I, having booked my return ticket the night before), and got some sleep as we headed back to Oriente. We dropped off luggage back at my Airbnb before heading to the expo, which was a bit more crowded on this Saturday morning for obvious reasons, and then headed into the Rossio to more or less recreate my afternoon from two days ago. 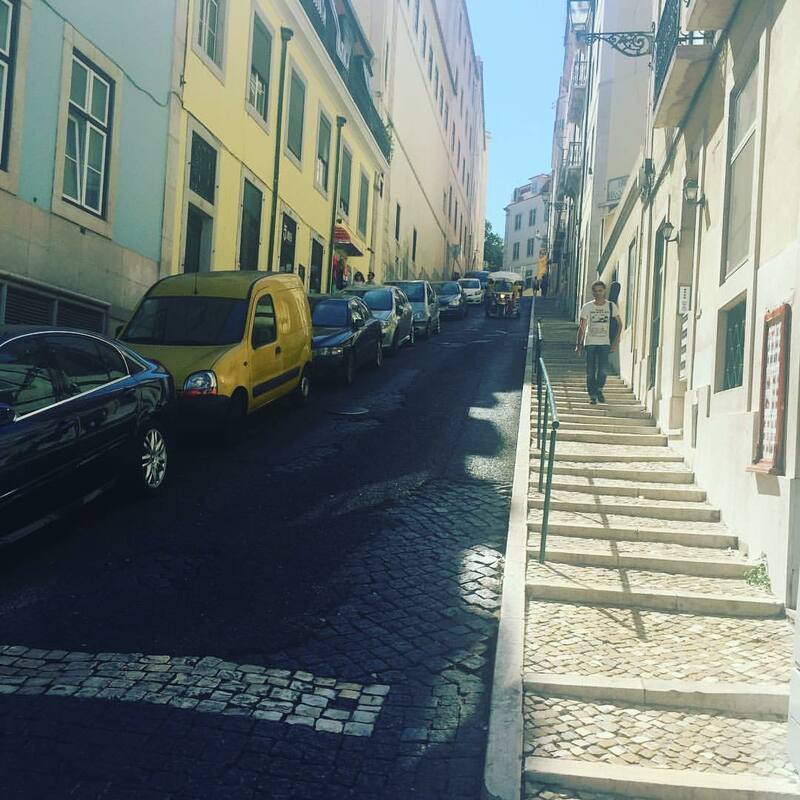 This time, though, we also had a chance to stop into the little Ginjinha shop at the foot of a set of stairs leading up to the Bairro Alto. Ginjinha is a Portuguese liqueur made with ginja berries (sour cherry), sugar, and aguardiente. It is a favourite liqueur of many Portuguese and a typical drink in Lisbon and its surroundings. With the afternoon left to discover more of the city, we decided to take the commuter train out to Sintra, 45 minutes away, and leaving directly form the Rossio train station. Sintra is known for its many 19th-century Romantic architectural monuments, which has resulted in its classification as a UNESCO World Heritage Site. Its rugged terrain is also home to several important attractions, including the medieval Castelo dos Mouros, the Peña Palace, the National Palace, and the Regaleira Palace and Gardens, to name a few. 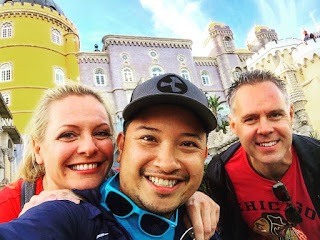 In Sintra, we would hop onto a bus that circles all of the attractions in a big loop - but come to only see one of the sites which would take most of our afternoon up, the Pena Palace. The Peña Palace is absolutely a wonder to behold. It was built in the mid-19th century on the site of a former monastery by the Portuguese king-consort Dom Fernando II as a summer palace for the royal family. In doing so, he combined various architectural styles into something that at first glance most resembles a wedding cake utilizing some of the most brilliant and vivid color choices. The palace is one of Portugal's most visited sites. Our self-guided tour consisted of visiting the grounds of the palace (some of which had some incredible views of the Tagus River, Lisbon in the distance, and even the Atlantic Ocean) as well as the beautiful interior, consisting of various parlors and bedrooms with beautifully handpainted walls and ceilings, many of which had been painstakingly restored to their original splendor. We headed back from Sintra as the sun was beginning to set. 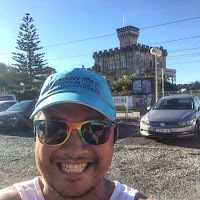 With our race beginning early the next morning - myself in particular, since I had to get all the way out to Cascais, we opted to get dinner at an Italian place relatively early as we returned back to the Oriente area near my Airbnb. After a delicious meal, we retired back to our accommodation to get a good amount of rest and lay out whatever clothes I needed while packing everything else away, since I had to manage my time with my flight being Sunday afternoon, mere hours after finishing the marathon. I woke up quite early the next morning, and got dressed for the race as the other two slightly stirred from their sleep, as their race would start two hours after mine, and they only had to get to the street in front of the Oriente station to get shuttles to the half marathon start on the Vasco da Gama bridge. Knowing the metro system would not be operating at that time, I got an Uber to pick me up at that ungodly hour and take me to Cais do Sodre train station for only €9. 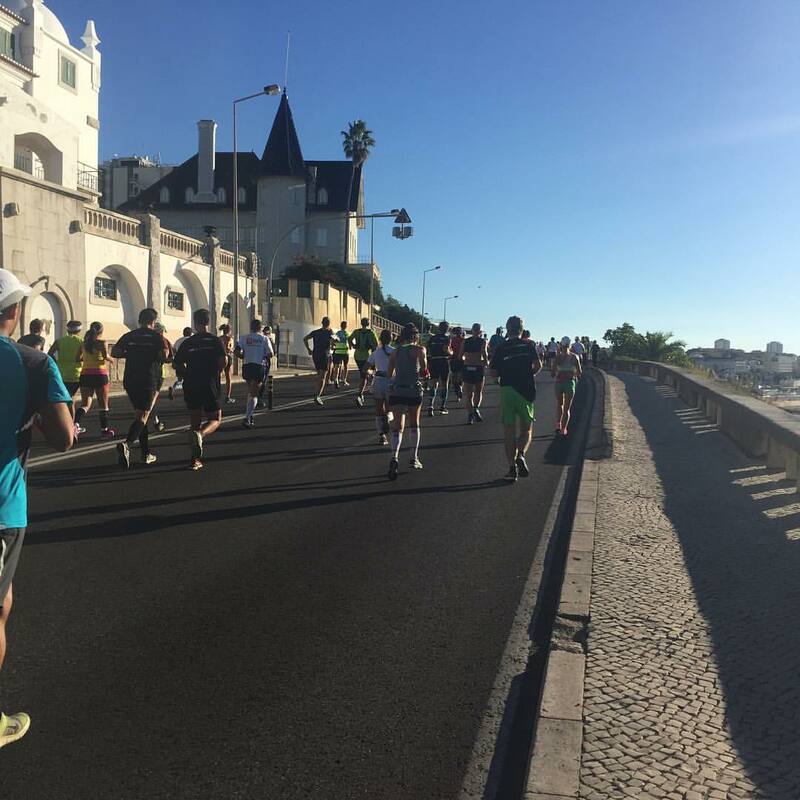 From there, runners were allowed to board the train free of charge by showing their bib, and take it to the last stop on the line to Cascais. 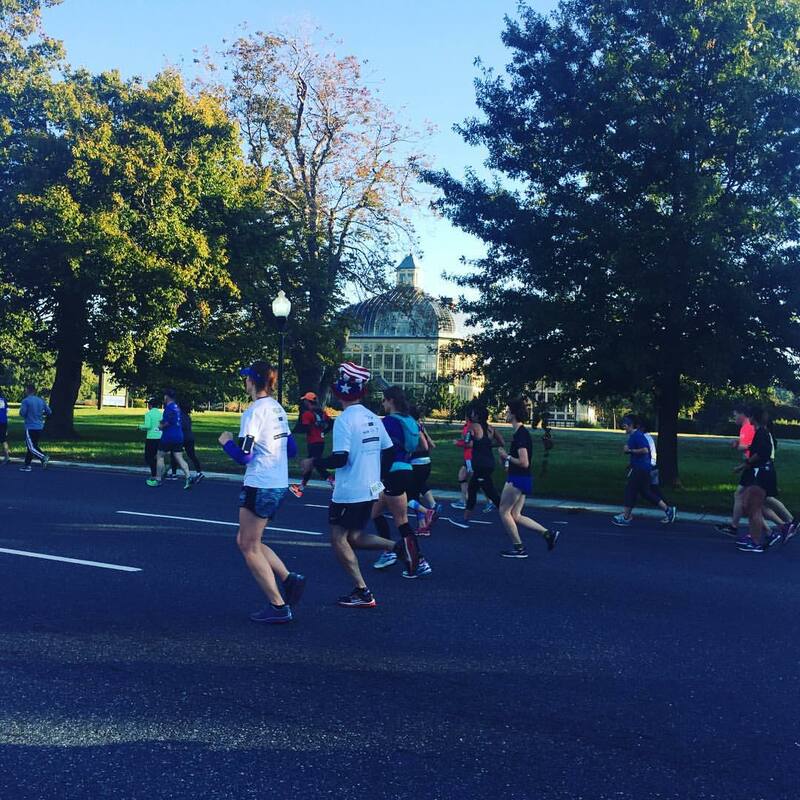 Already, at 6:30AM, the area was buzzing with marathoners prepared to get to the start via the roughly 33 minute train ride. 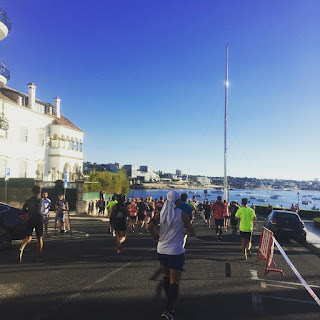 Upon arrival at Cascais, we embarked on a quiet, 3/4 mile walk to the start line from the train station, just as the sun was coming up over the horizon. 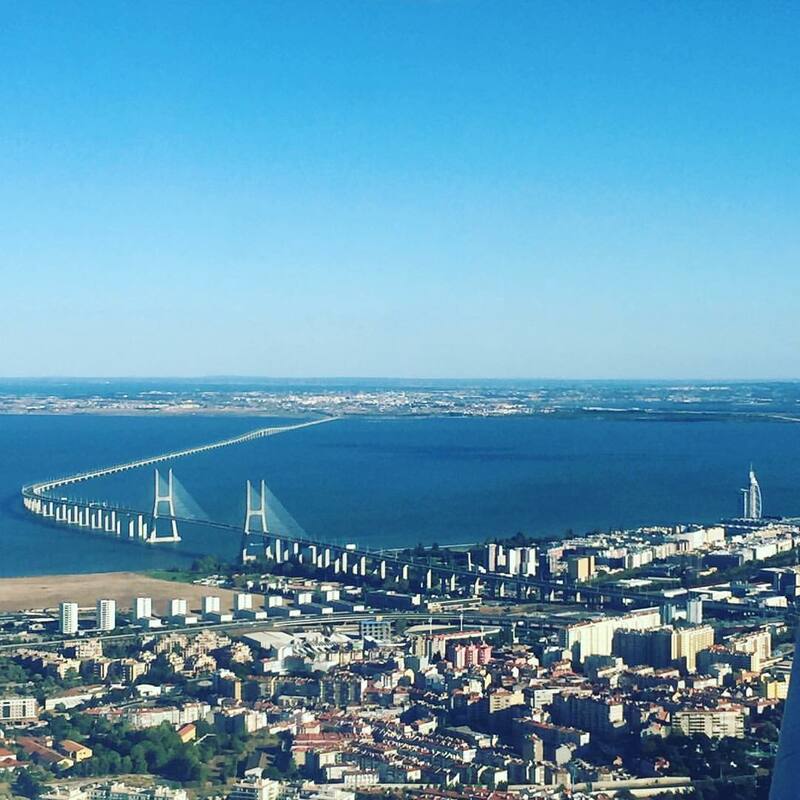 We were treated to gorgeous views of the Rio Tejo, with sailboats dotting the water and the sky a mix of pinks and oranges. Normally, it can be very windy in Cascais (particularly in the afternoons), but this morning it was just PERFECT. I got to the start area alongside Marechal Carmona Park. 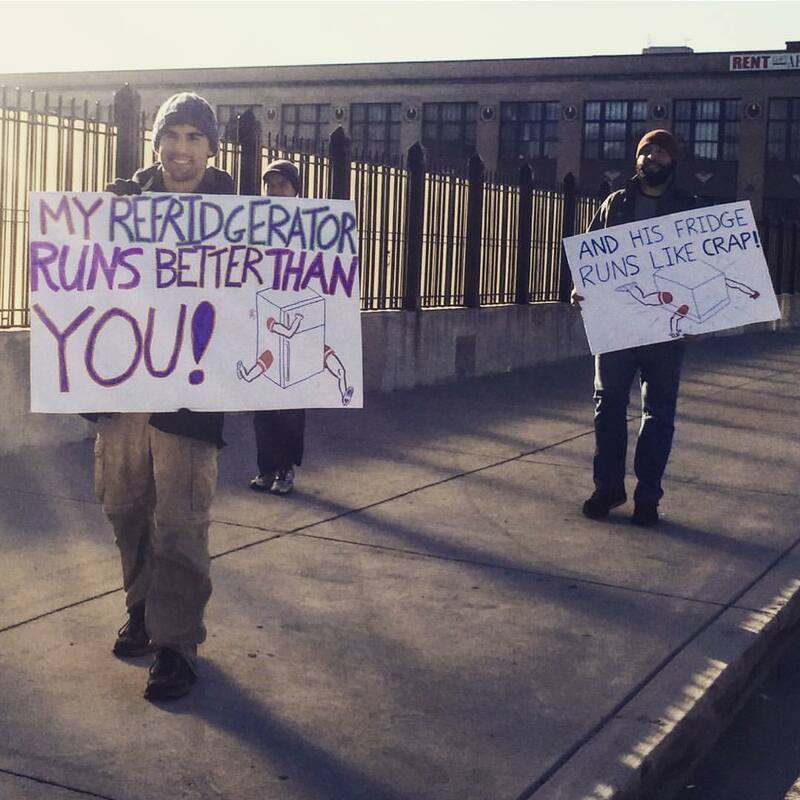 Already, the weather was nice and balmy, and in the high 50s. It was going to be a WARM day. 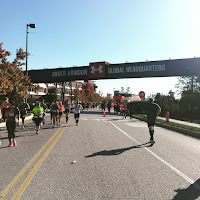 I stood in line for port-a-potties with several other runners in the parking lot of the Hipódromo Manuel Possolo next door, and while they were getting lengthy, I waited my turn. 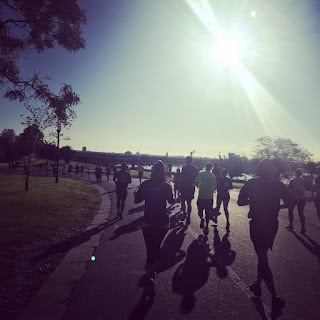 However, in line only a few people in front of me, it seemed a runner decided to take the ONLY roll of toilet paper in the port-a-potty with him, angering those of us in line. Ah well. When the "corrals" were opened, we self-organized ourselves on the Avenida República, and then made our way past the startline just after 8:30. At first, we headed up to a short out and back on the Avenida Infante Dom Henrique, then took the Avenida Vigia do Facho to the river. 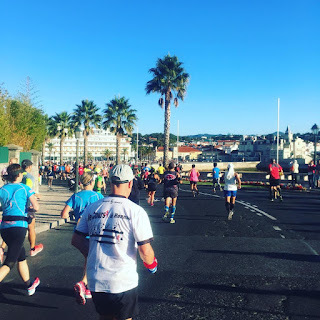 We would be right alongside the river for the rest of the way, and pass the downtown area of Cascais onto the N6/Avenida Marginal highway, first passing several of the area's beachside resorts, running eastward toward Lisbon. 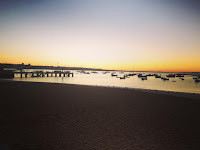 Cascais was once just a small sleepy fishing village on the outermost point of the bay of the Rio Tejo, and is an important part of metropolitan Lisbon. 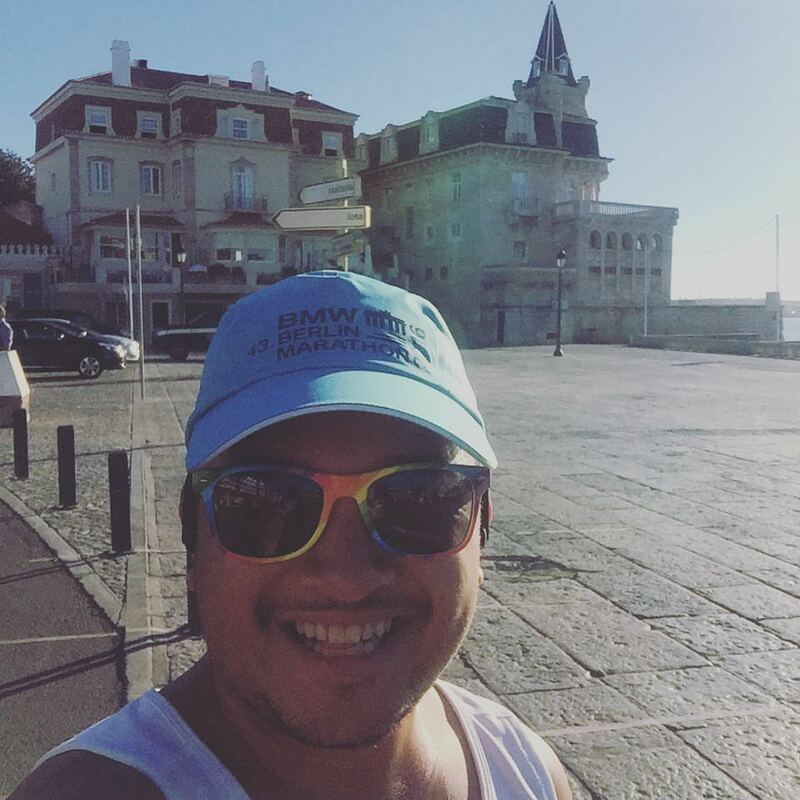 In the late 19th century, King Luís I decided to turn the citadel of Cascais into his summer residence, so that the whole Portuguese royal family could enjoy the sea and spend their summer vacation there, only a short distance away from the center of Lisbon. 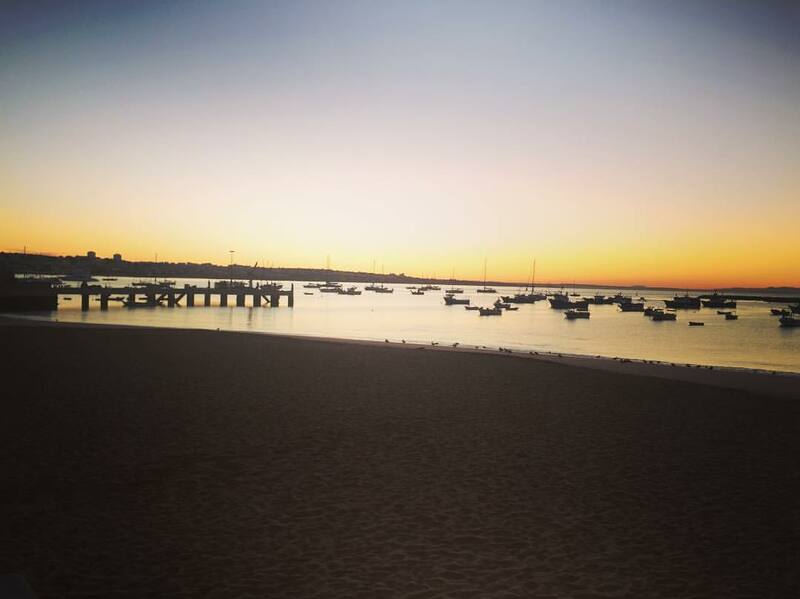 As a result, Cascais enjoyed many privileges and became a popular residence among nobles. It was the first in the country to enjoy electricity in 1878, and gained its railway eleven years later. Many mansions that were built then still remain to this day. 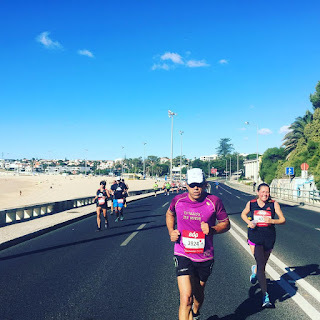 While I knew the elevation of the whole marathon was relatively flat, it seemed some of the more recognizable uphills in the race were early on, as we made our way through Estoril and its prominent beach, Tamariz, which was at about the 5K mark of the race. Also along the way, we saw the Forte da Cruz, an impressive fort that was first built in the 17th century by the Portuguese monarchy, used to protect the Portuguese coast from oncoming enemies. Now it is used as an event space. 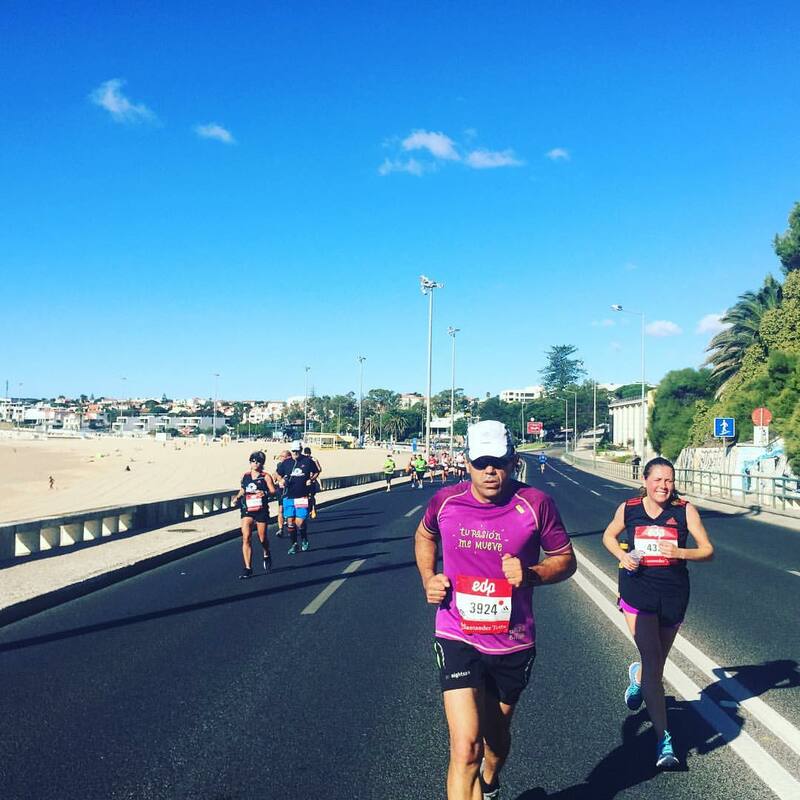 We also passed through the villages of São João do Estoril and São Pedro do Estoril at miles 4 and 5 of the race. 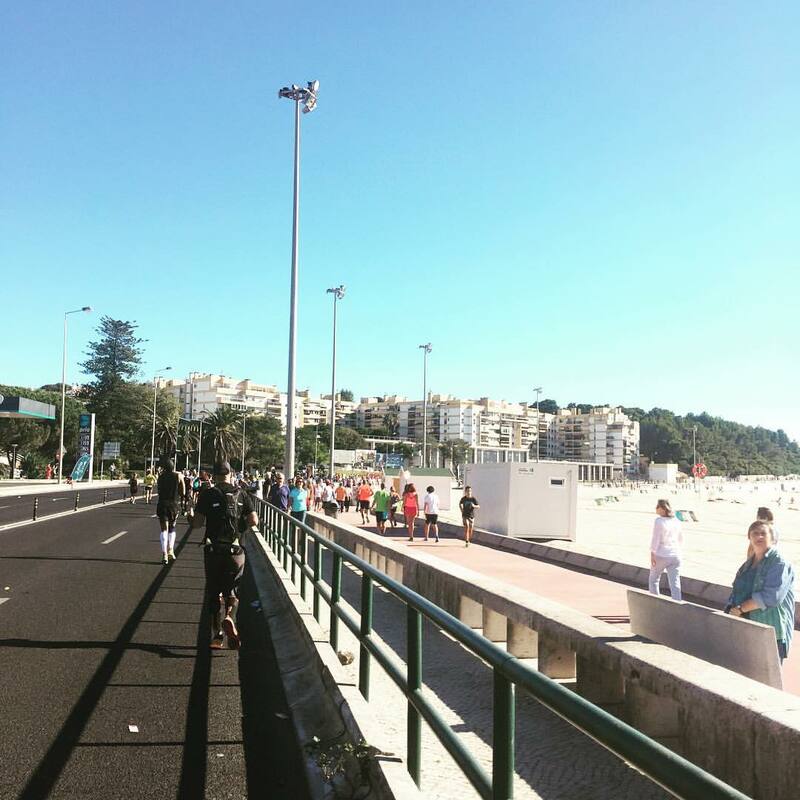 We continued along the coastal road, passing the beach in Parede, a mostly stony beach with small sandy stretches, at mile 6; and the largest beach in this part of the riverside, Carcavelos, at mile 7. Carcavelos Beach is very popular and very accessible. It is an energetic beach full of activities, from kitesurfing to board surfing, as well as paragliding. Formerly, Carcavelos was a small fishing town, but now is surrounded by newly built apartment buildings and condominiums, but some of its old charm still remains. 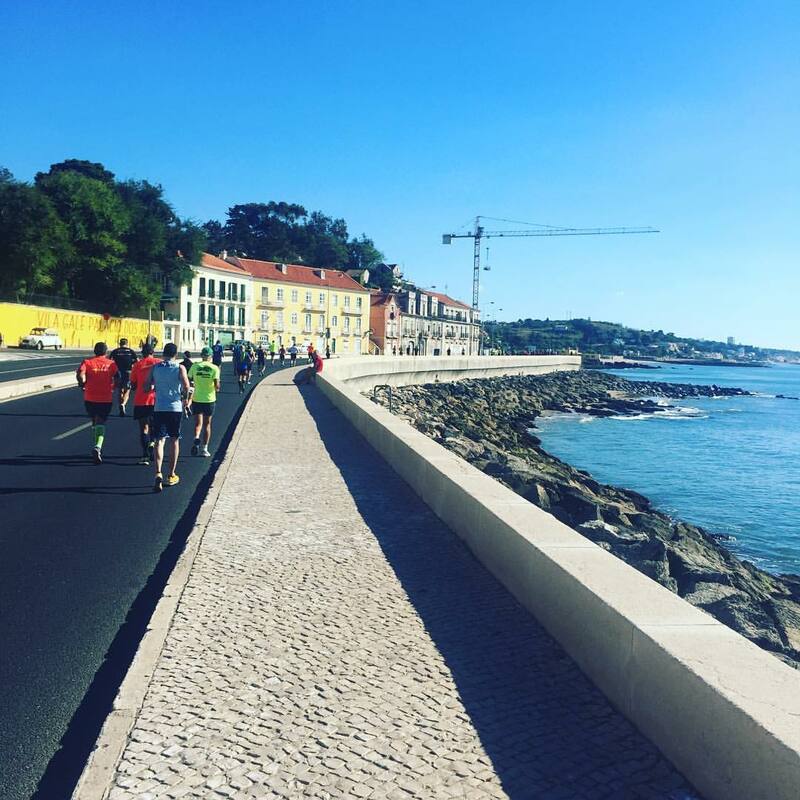 Further east, at the mile 9 mark, is Oeiras. Oeiras is a hugely popular beach town, as it is the first town outside of Lisbon proper along what's known as the Estoril coast. The water here is relatively still, and the beach is reasonably sized with many bars and restaurants. It’s especially popular among families and the after work crowd. 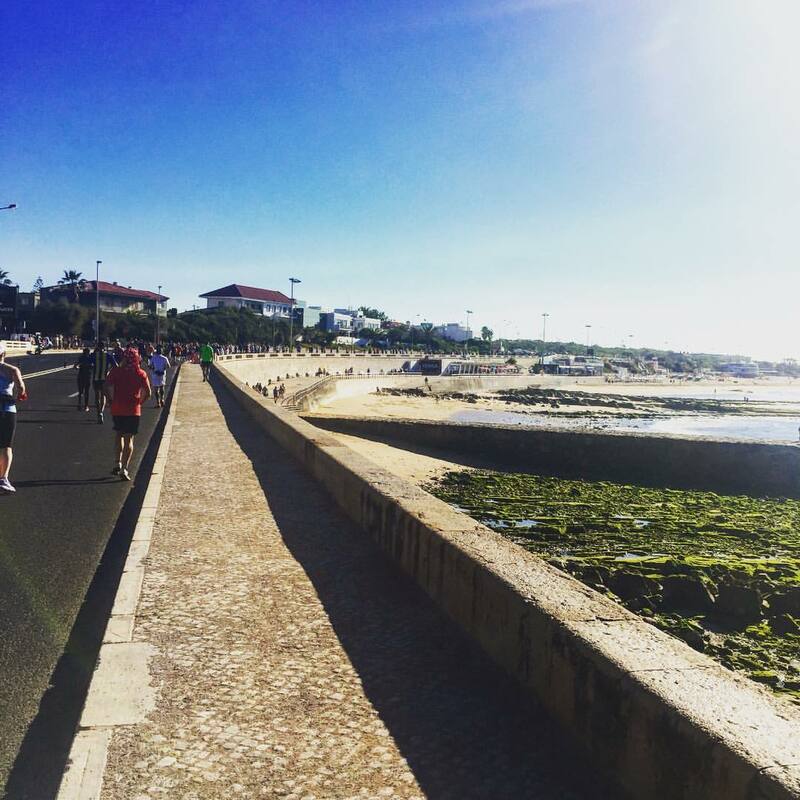 The town of Oeiras, which feels more like a suburb of Lisbon than a town by itself, is within walking distance. Looking behind me as I run through Oeiras. At the 10 mile mark, we reached the locality of Paço de Arcos. Deriving its name from the Palácio dos Arcos, located along the water, this location was where King Don Manuel I of Portugal watched Vasco da Gama's caravels leave for India. This is also the site of the Escola Náutica Infante D. Henrique, Portugal's maritime academy, dedicated to education and training of merchant marine officers, as well as the training of other professionals for the maritime industry, ports, transportation and logistics. 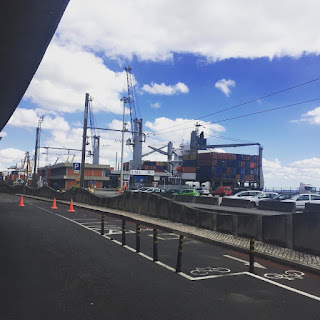 A mile later, we were in Caxias, at a point where we got off of the asphalt of the Avenida Marginal for the first time, and followed the seawall that ran parallel to the train tracks. 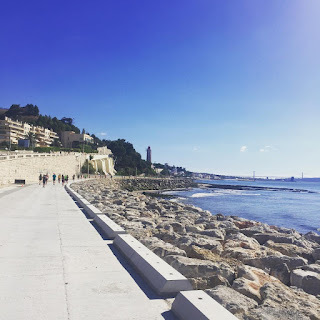 The approach onto the seawall was a bit gravelly with uneven surfaces, but the nice part of this area was having it be lined by spectators holding national flags of the marathon participants. In the distance, we could see the 25 de Abril Bridge. 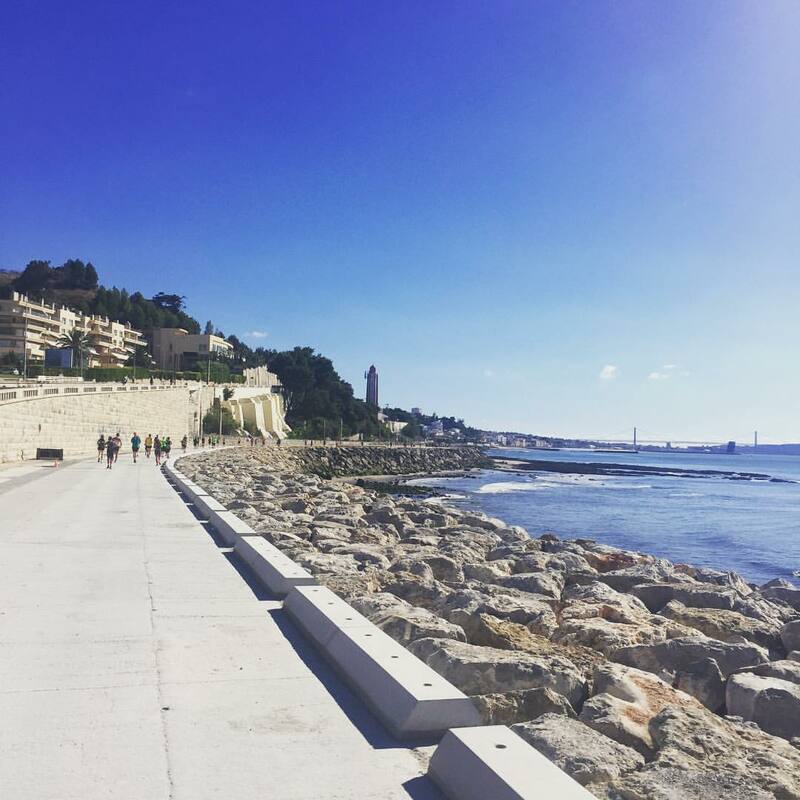 The seawall was made of concrete, which offered an alternative, if not less reactive surface to run on, but thankfully this was only for a short period of time. 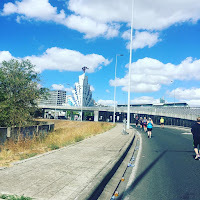 It was roughly about a mile on this section of the course, before we returned to the Avenida Marginal, after ramping down to an underpass under the train tracks. Upon returning to the highway, we entered the area of Cruz Quebrada-Dafundo, as well as the halfway point of the race. Much of this section of the course was under the cloudless sky and the blaring sun, with an endless stretch of three to four-story apartments on the left and the train heading back and forth from Cais do Sodre and Cascais on the right, with the Tagus just beyond. 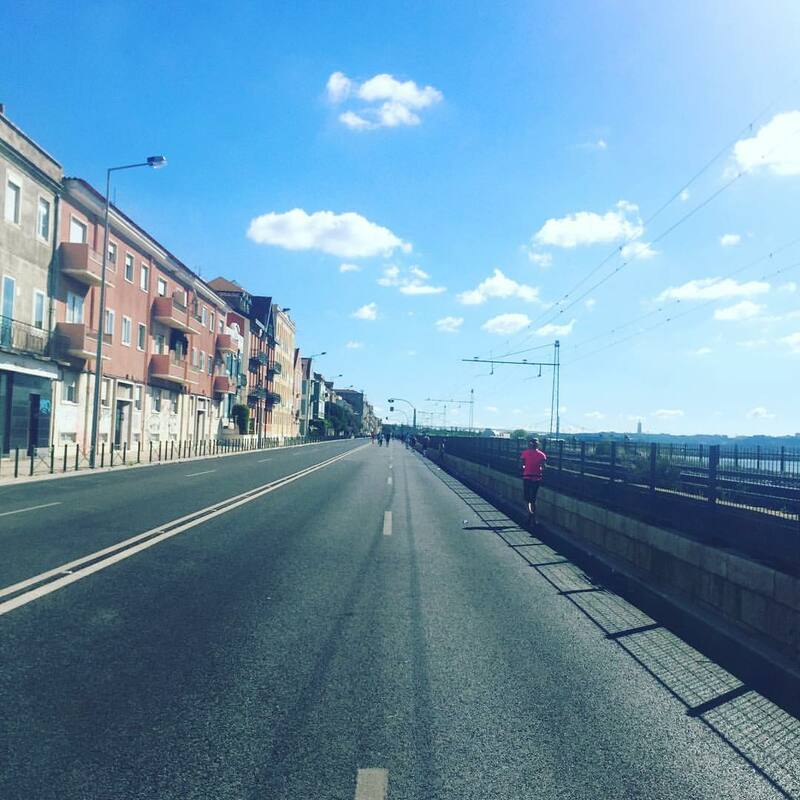 By mile 15, we had reached Belém, the area that I had visited on my first full day in Lisbon. 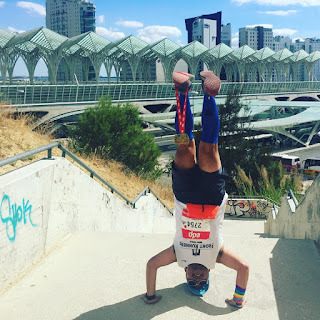 Along the course, we were treated to awesome views of the Jerónimos Monastery, as well as the Torre de Belém, which I had initially expected to be much closer to where we were running, but unfortunately, the train tracks formed a physical barrier from being able to run right alongside it. As we continued along the road (which had changed its name to Avenida da Índia), we reached the parish of Alcântara, and ran underneath the span of the 25 de Abril Bridge, the 27th largest suspension bridge in the world. On the other side of the bridge, we could see the Cristo Rei statue on the south bank of the Rio Tejo. The Santuário de Cristo Rei is a Catholic monument and shrine dedicated to the Sacred Heart of Jesus Christ overlooking the city of Lisbon in the city of Almada. Completed in 1969, it was inspired by the Christ the Redeemer statue of Rio de Janeiro, in Brazil, after the Cardinal Patriarch of Lisbon visited that monument. Bridge, with Cristo Rei in the distance. Continuing along the course, we got closer and closer to the "center" of Lisbon. 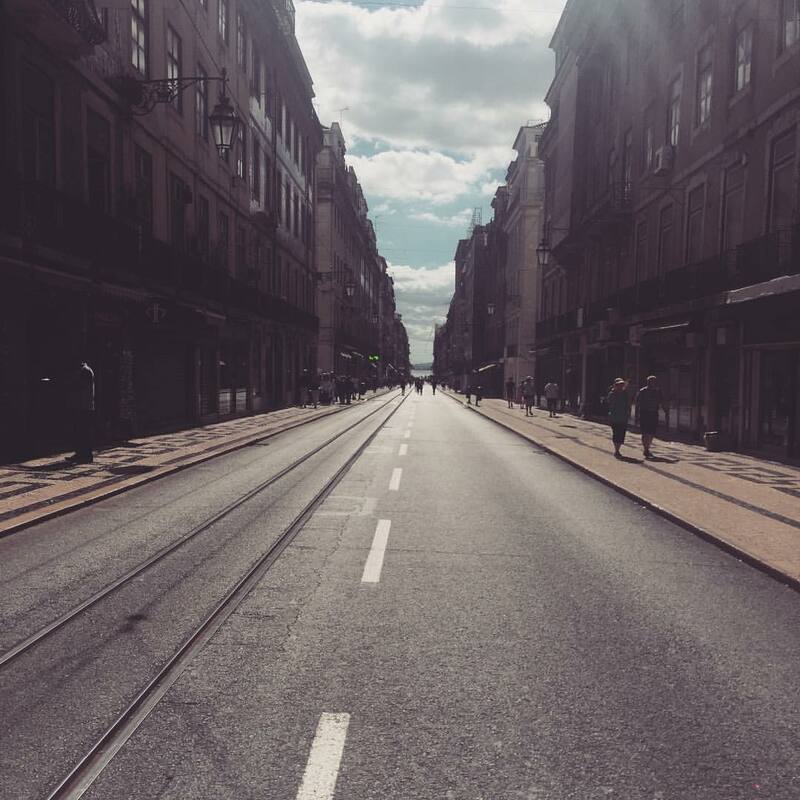 Now running on the yet again name-changed street, the Avenida 24 de Julho (they sure love to commemorate dates here in Portugal! ), we reached the National Museum of Ancient Art at mile 18, or the "MNAA" (Museu Nacional de Arte Antiga). By Mile 19, we had reached the Cais do Sodre station, where I had begun my trip earlier in the morning. On the other side of the street was the unmistakable oriental dome and large clock face of the ironclad Mercado da Ribeira, Lisbon's main food market since 1892. We made a short turn toward the river, passing by the pink buildings of the Portuguese Navy, as we ran along the Ribeira das Naus, a redeveloped waterfront pedestrian promenade where many of the legendary Portuguese explorers' ships were built. 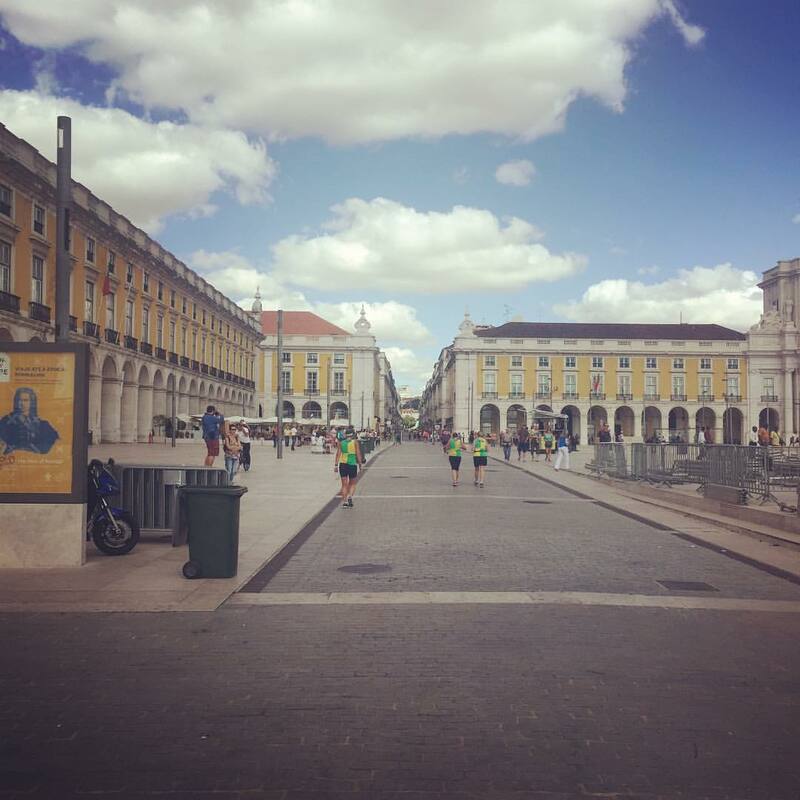 Immediately after passing these buildings, we turned once again, as we reached the Praça do Comercio, and headed northward for our trek toward the Rossio along Rua Áurea. Around this point, there were a trio of ladies wearing unmistakable green and yellow jerseys (perhaps they were from Brazil?) and I ended up playing a bit of leapfrog with them as we took this out and back onto the Rossio. This was probably where we were greeted with the most amount of spectators so far in the entire race. 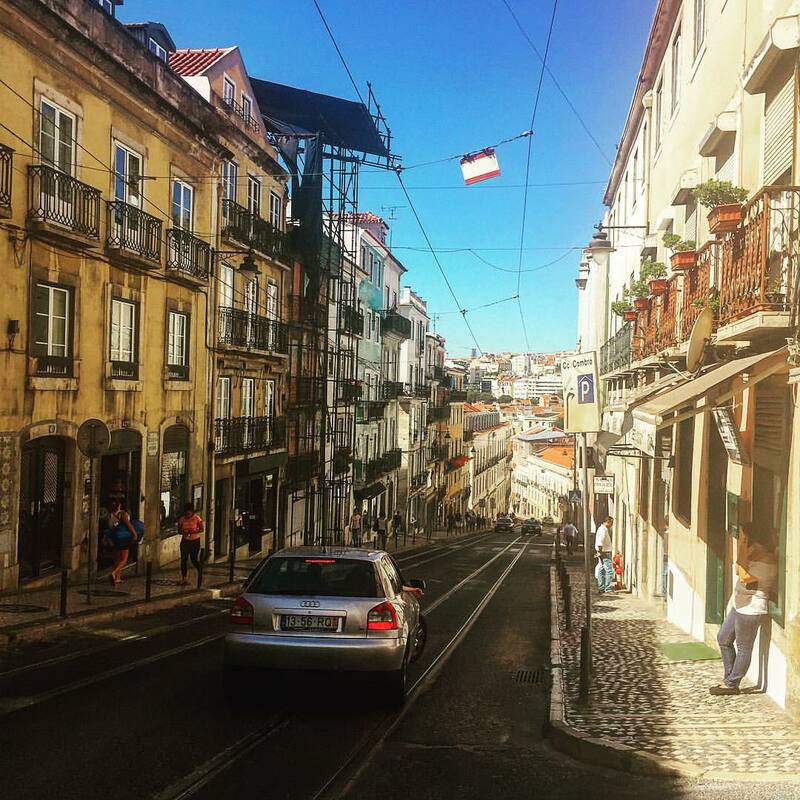 As we headed back toward the river, we were treated with brilliant vanishing point views along the canyon-like Rua da Prata. 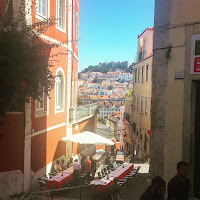 As we headed back onto the riverside street (again, renamed... now called the Avenida Infante Dom Henrique), we ran through the Alfama, the oldest district of Lisbon, spreading on the slope between the São Jorge Castle and the Tejo river. 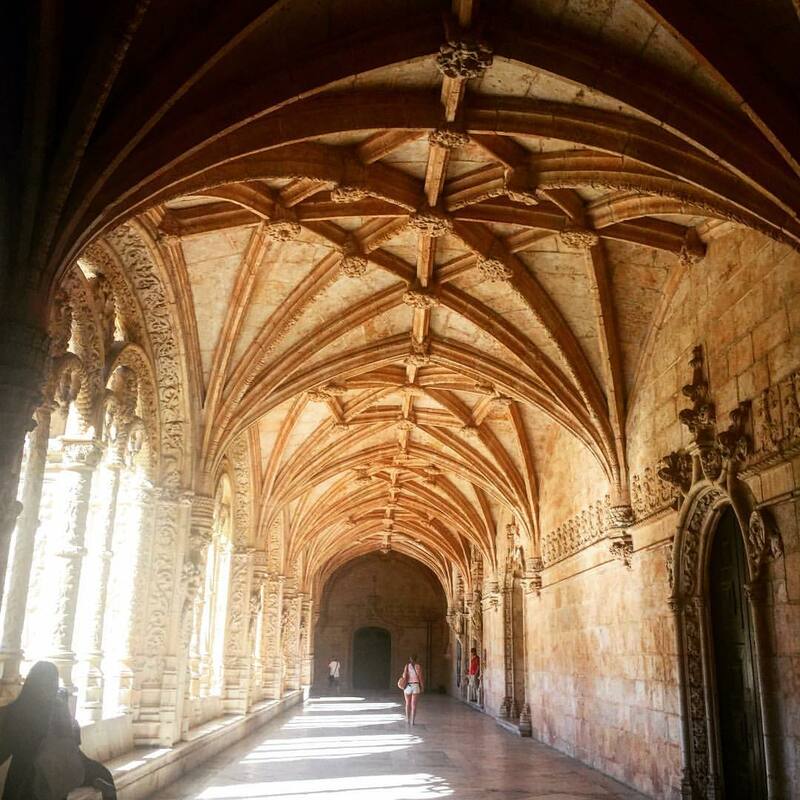 Further inland within Alfama are some of Lisbon's most historically important buildings, including the Se Cathedral, Lisbon Castle, National Pantheon and Saint Anthony’s Church. 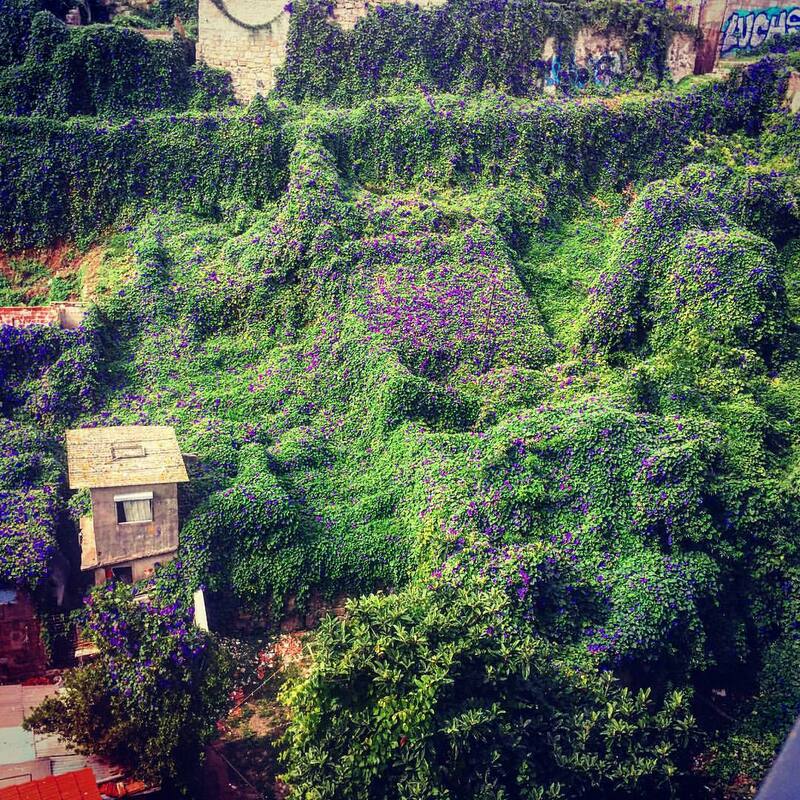 Prior to the 13th century, Alfama was the district just outside of the city walls, and home to Lisbon’s poor. This tough and deprived reputation continued as Lisbon expanded and Alfama became home to the dock workers and sailors. 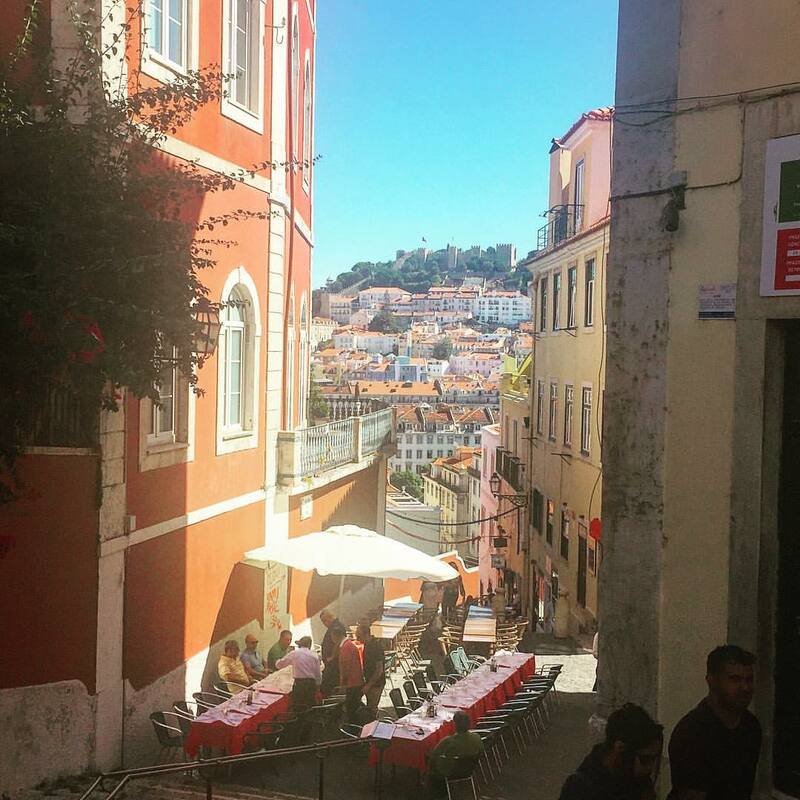 Today, Alfama has become a young, trendy and fashionable area of Lisbon but, fortunately, has lost none of its ancient charm. Here, we also finally began to see some of the back-of-the-pack runners for the half marathon, who had an out and back running to a turnaround point in Alfama, at their 8 mile mark, our 21 mile mark. The canyon like Rua da Prata heading back to the Praça do Comercio. 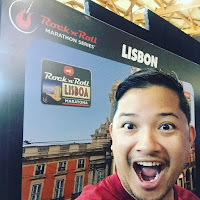 The last few miles of the race as we headed toward the Parque das Nações were through the "off-the-beaten path" neighborhoods of Beato and Marvila, in Lisbon's east end. Once a pleasant area with farms, wineries and convents dating back to the 16th century, the area became an industrial hub and factories proliferated in the centuries that followed. It was by far not the prettiest part of the race course, but in this “cemetery of factories”, as some call it, a renewed city is being born. Attracted by the lower rental prices many young people are starting projects in industrial places, such as creative cultural spaces, charming cafes, craft breweries, and rock climbing facilities - all interesting adaptive reuse opportunities that make this architect-slash-urban planner quite appreciative of its re-envisioning. 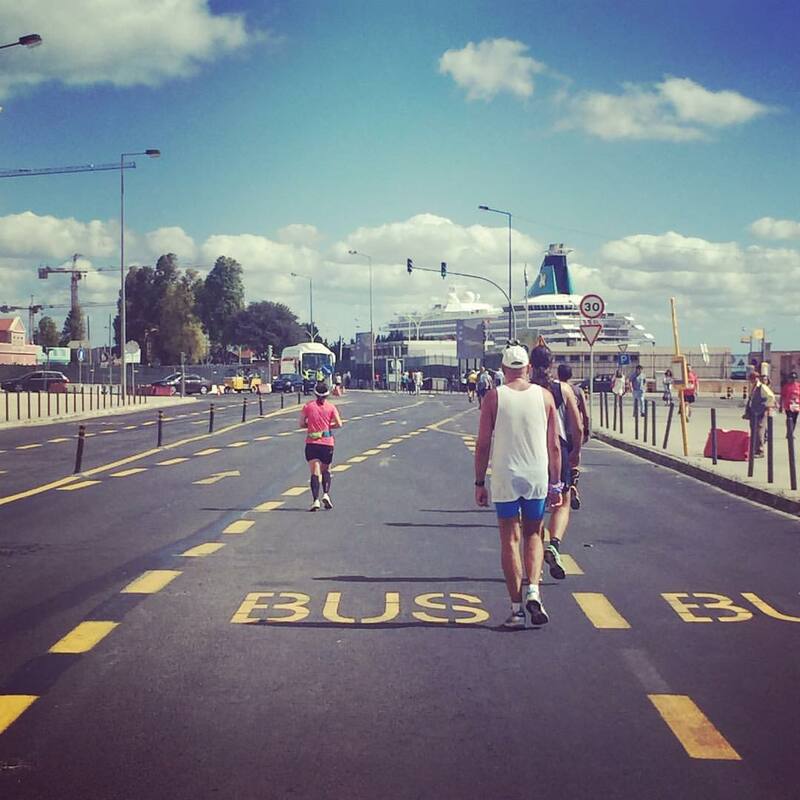 Running through Alfama and seeing a cruiseship docked in the distance! 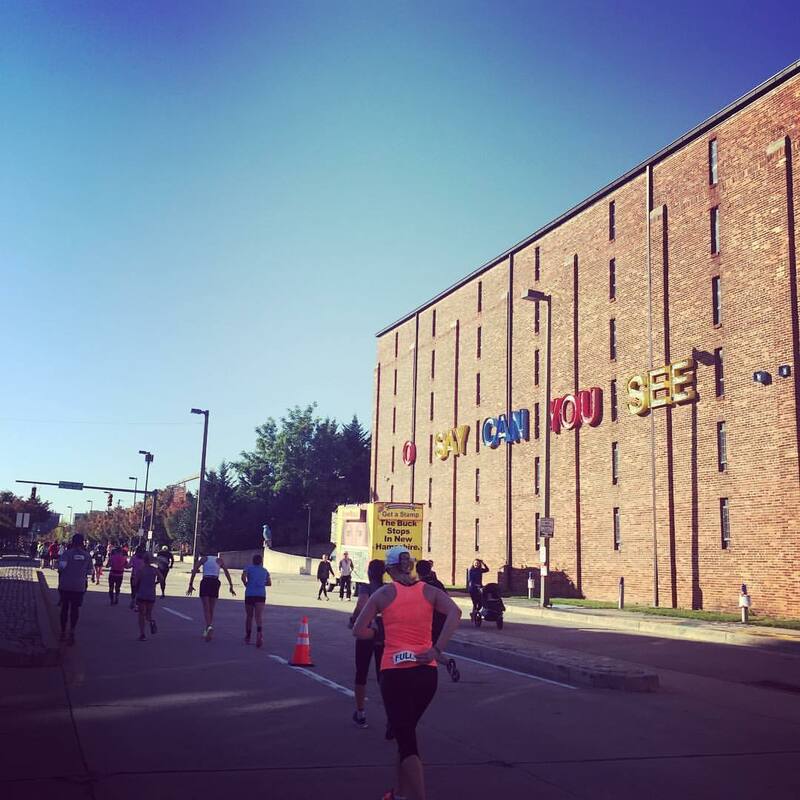 The more industrial part of the race. 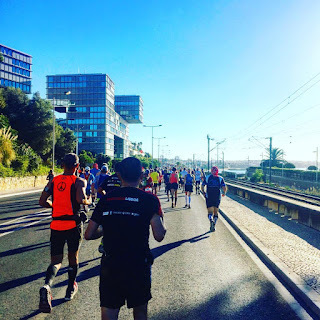 For the last mile and a half of the race, we ran through the Cabo Ruivo section of Lisbon with the end goal in sight, making our way toward the finish line at the Parque das Nações. We passed the unique façade of the 19-story tall Edificio Écran along Alameda dos Oceanos, which has the most extensive tile-fronted façade in Lisbon. Its imposing corner location has shows off vivid blue rays that diverge from the bottom of the building to the top. 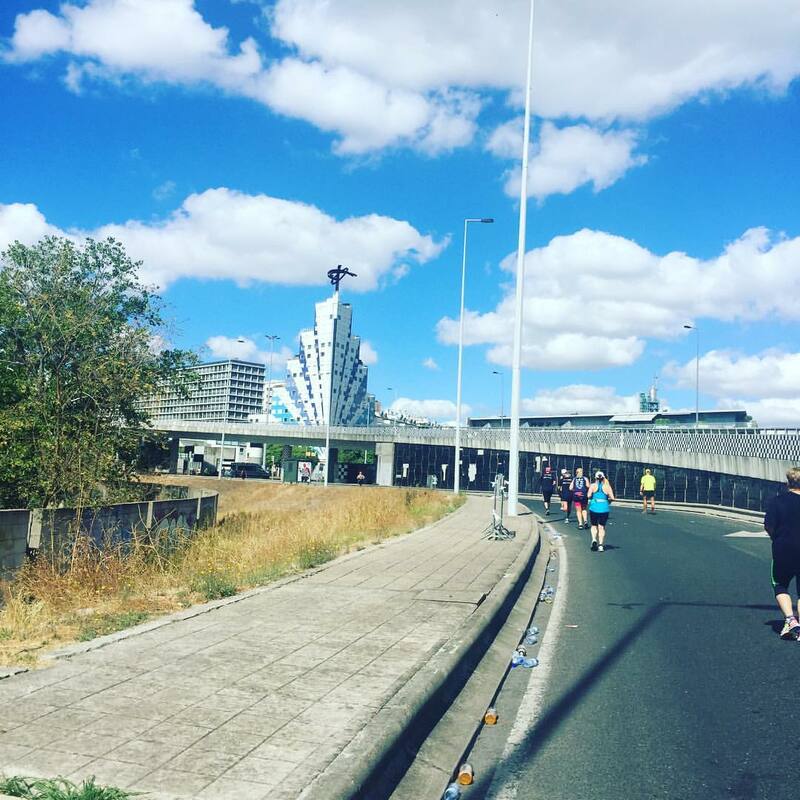 We made our way closer and closer to the finish, passing the modern buildings that enliven this part of the city, many built as part of the reclamation of the land during the 1998 World Exposition. 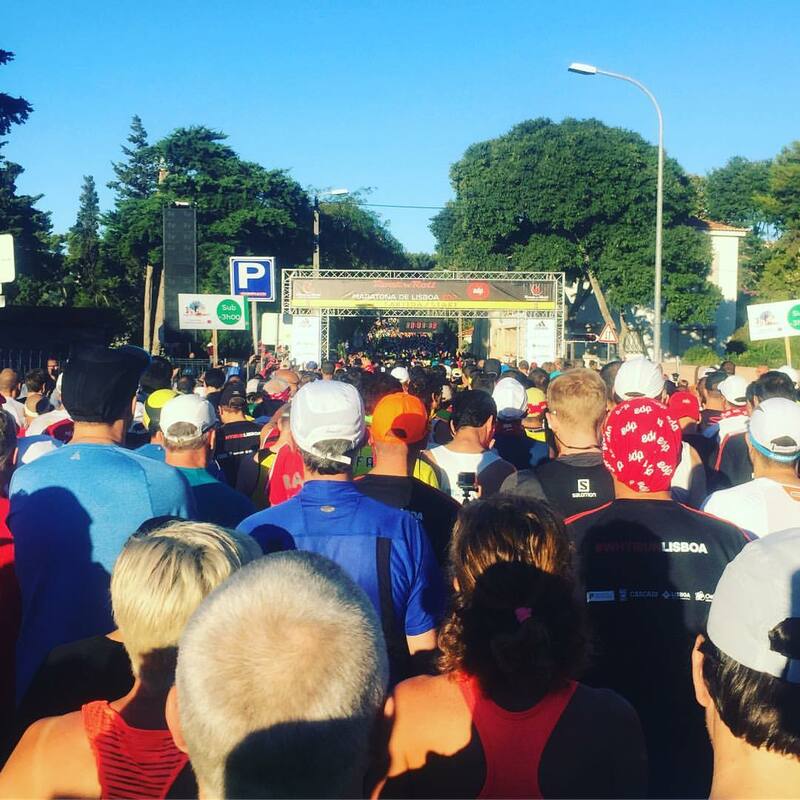 The crowds became more substantial along the Avenida Dom João II, as we made it down the final stretch past the Oriente train station, and looped ourselves around to the finish chute in front of the MEO Arena. I finished the race in 5:18:01, eight minutes faster than the week prior in Berlin. I found Jennifer quite quickly afterward, as she was waiting around for me, and we rushed back to the apartment. I took my headstand photo at the top of the hill near my Airbnb that overlooked the Oriente station's glass and metal lattice roof, designed by famed Spanish architect Santiago Calatrava. I had a short amount of time to get showered, dressed, and then rush out of the Airbnb with Pete to make it back to the airport via Metro for my flight back to the US that afternoon. Thankfully, it was free to enter the Metro since we ran the race! 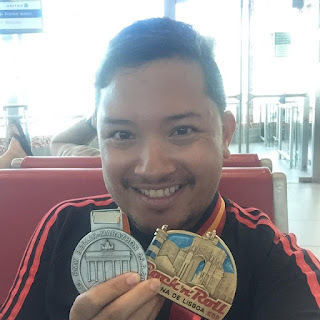 I arrived at my boarding gate with lots of time to spare, despite having to wait in several different queues to check in and for security, and then walk a LONG distance on tired marathon legs through the airport. 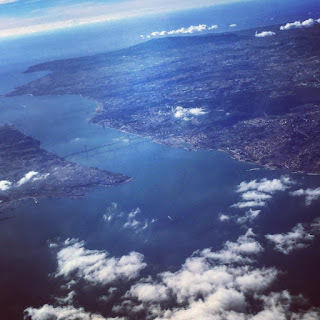 It was an exciting couple weeks in Europe, and I was treated to beautiful views out my window seat of the city below, as we journeyed across the Atlantic back to New York City. Beautiful... and to think, I ran on that entire coastline!